The U.S. state of Maine is located in the northeastern corner of the nation. The rugged, deeply indented coast of the state has about 70 lighthouses, covered by the Directory on two pages. 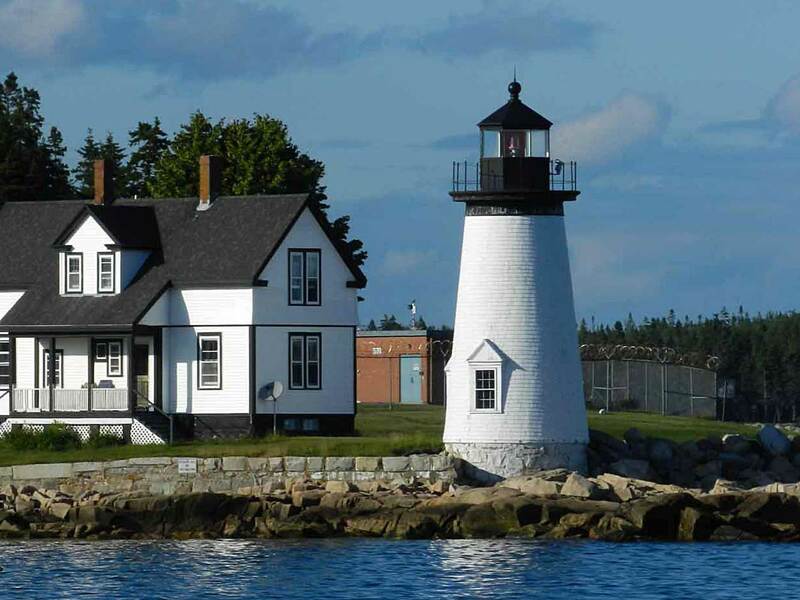 This page includes lighthouses of the eastern coast of Maine from the Penobscot Bay islands east to the Canadian border. This includes the area widely known in Maine as "Down East." 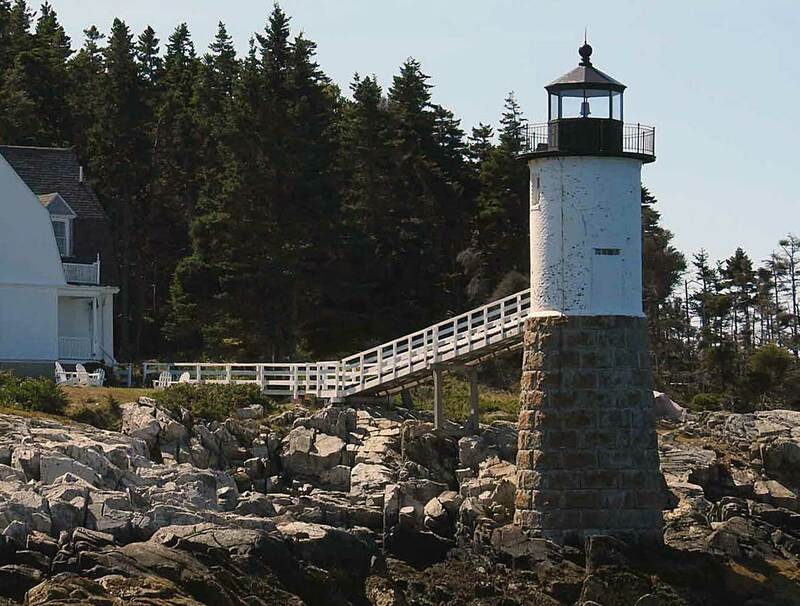 Lighthouse preservation is very strong in Maine, as evidenced by the large number of local preservation societies and trusts. 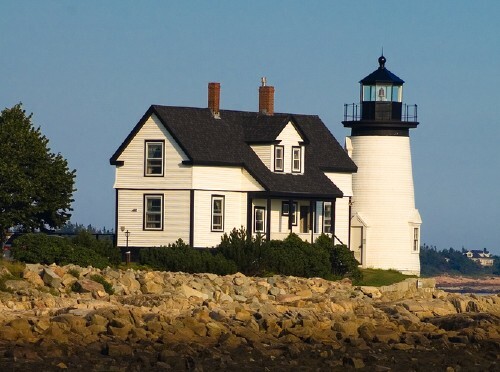 The Maine Lights program, passed by Congress in 1996, led to the transfer of 28 lighthouses from the Coast Guard to local preservation groups or other agencies and served as a model for the National Historic Lighthouse Preservation Act of 2000. Except for eight privately-owned towers, all but a handful of Maine's lighthouses now have local support groups. 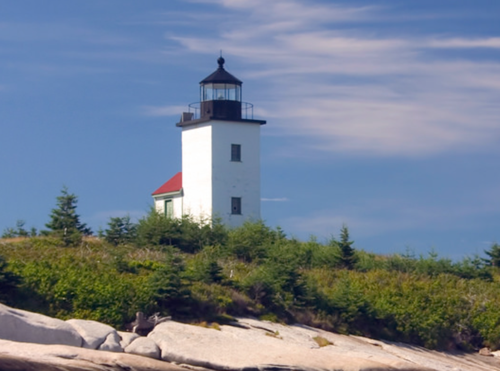 In addition, two powerful national forces for lighthouse preservation, the American Lighthouse Foundation and Lighthouse Digest magazine, are based in Maine. 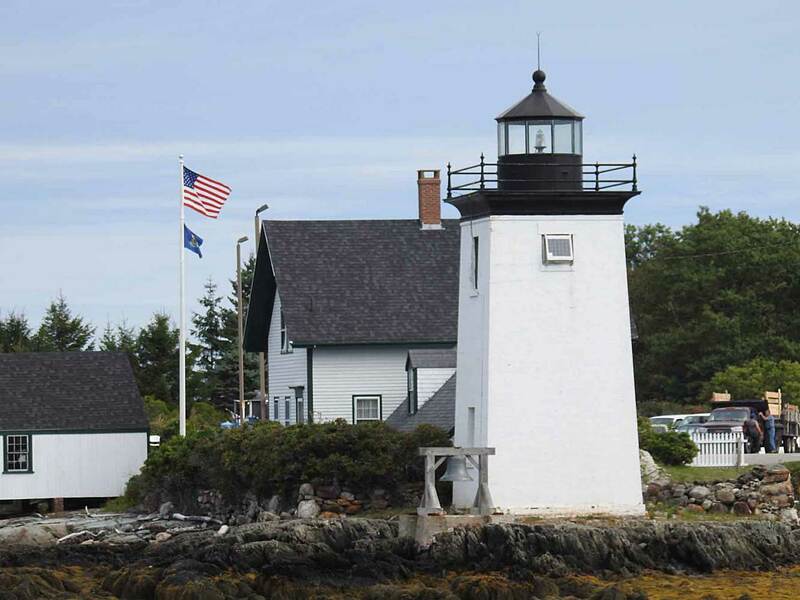 Aids to navigation in Maine are maintained by the U.S. Coast Guard First District, but ownership (and sometimes operation) of historic lighthouses has been transferred to local authorities and preservation organizations in many cases. ARLHS numbers are from the ARLHS World List of Lights. Admiralty numbers are from volumes H and J of the Admiralty List of Lights & Fog Signals. USCG numbers are from Vol. I of the USCG Light List. For lights close to the Canadian border, CCG numbers are from the Atlantic Coast volume of the Canadian Coast Guard's List of Lights, Buoys and Fog Signals. Jeremy D'Entremont's web site has extensive data, historical accounts, and photos for all of the lighthouses. D'Entremont also has more than 1000 photos on Flickr.com, and he has written several excellent books about Maine lighthouses. Photos and historical accounts of Maine lighthouses from Kraig Anderson's LighthouseFriends.com site. Photos by various photographers posted by Alexander Trabas. Many of the photos from this area are by Michael Boucher. Photos by various photographers available from Wikimedia. From Lighthouse Getaway (Bill Britten, University of Tennessee): photos and brief accounts of many of the lighthouses. Aerial photos posted by Marinas.com. World of Lighthouses - Northeast Coast of U.S. Historic postcard images of U.S. lighthouses posted by Klaus Huelse. Nautical charts for the coast can be viewed online. 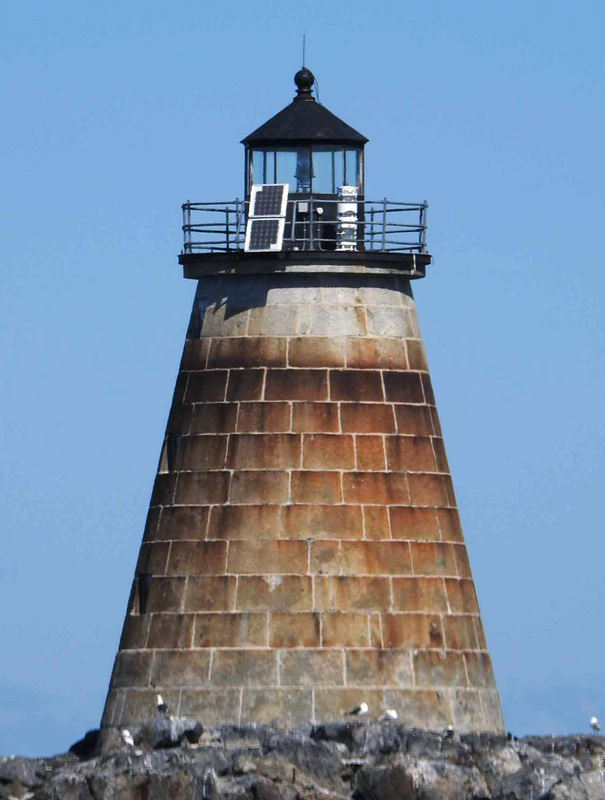 The USCG Light List can be downloaded in pdf format. 1910. Active; focal plane 32 ft (10 m); green light, 3 s on, 3 s off. 25 ft (7.5 m) round cylindrical brick tower with lantern and gallery; 250 mm lens (1969). Lighthouse painted white, lantern painted black. 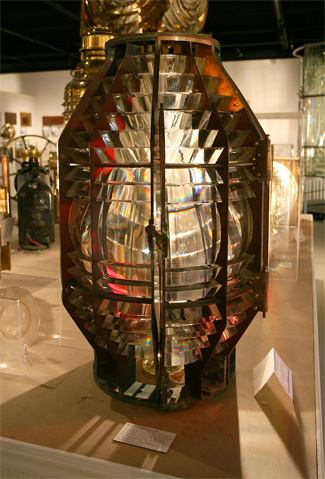 The original 4th order Fresnel lens is on display at the Maine Lighthouse Museum in Rockland. Original 2-story stucco keeper's house. Original stone oil house and square pyramidal wood bell tower (1931; bell removed). The interior of the tower is lined with ceramic tile, an unusual feature. Anderson's page has photos, Trabas has Boucher's closeup photo, Birding Maine has a 2008 photo of the lighthouse and fog bell tower, Marinas.com has excellent aerial photos, the Coast Guard has a historic photo, Huelse has a historic postcard view, and Google has a satellite view. 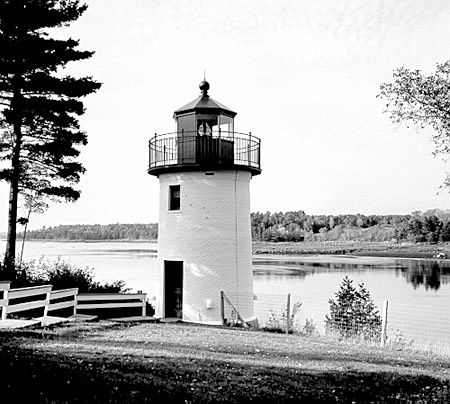 The tower was transferred to the St. Croix Historical Society under the Maine Lights program in 1998. The Society has a page for the lighthouse. In 2009, the Coast Guard installed a new VLB-44 LED optic. The keeper's house has been a private residence since the 1970s; it was sold in late 2004 or early 2005. The new owners have restored the house, and they also assist in maintenance of the lighthouse and bell tower. Located on the south bank of the St. Croix River about 3 miles (5 km) east of Calais. Site and tower closed, but the light can be viewed at a distance from a roadside park on US 1 a short distance east of the lighthouse. Tower owner: St. Croix Historical Society. Site manager: private. ARLHS USA-890; Admiralty H4138; CCG 061; USCG 1-0985. 1976(?) (station established 1857). Active; focal plane 101 ft (31 m); white flash every 2.5 s. Approx. 75 ft (23 m) steel skeletal mast. Tim Smith has a street view and 2015 photo in which the slender skeletal tower is seen at the center of the island, Trabas has Capt. Peter Mosselberger's photo, and Google has a satellite view. 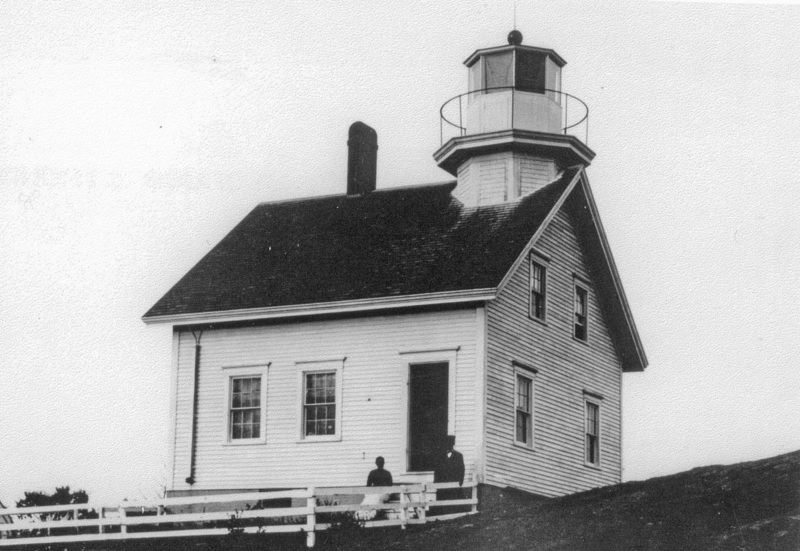 The historic 1857 lighthouse (rebuilt in 1901) was destroyed by fire in 1976. A 1-story boathouse, painted white (and seen in Smith's photo), is all that survives of the station. Scene of a French settlement in 1604-05, the island became a national park in 1984. The 400th anniversary of the French settlement was celebrated in 2004. As part of improvements to the park, the National Park Service restored the landing and boathouse, but the oil house was demolished. Located on St. Croix (Dochet) Island in the St. Croix River about 3 miles (5 km) north of Robbinston. Accessible only by boat; visible from a mainland visitor center off US 1 six miles (10 km) south of Calais and from the Canadian visitor center on the east bank. Site open. Owner: U.S. National Park Service. Site manager: St. Croix Island International Historic Site. ARLHS USA-792; Admiralty H4134; CCG 058; USCG 1-0950. 1890. 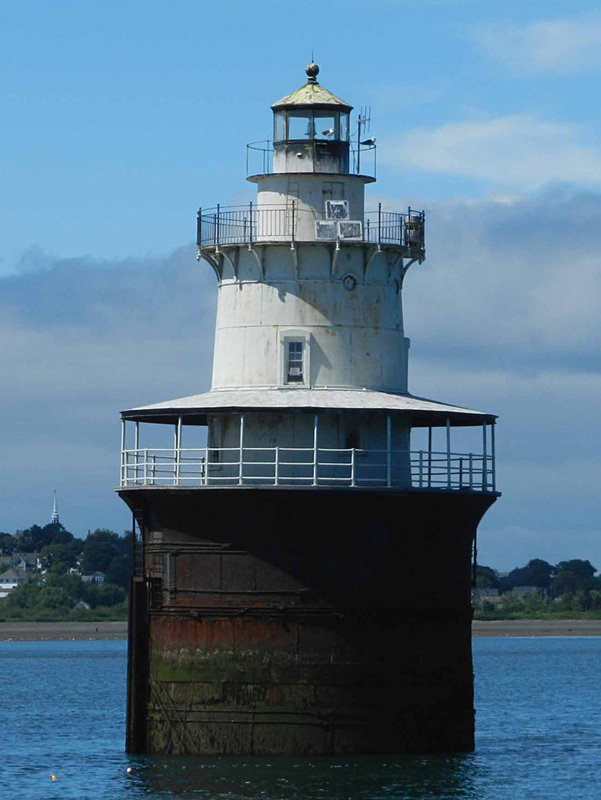 Active; focal plane 53 ft (16 m); white flash every 6 s. 40 ft (12 m) sparkplug style round cast iron tower with lantern and three galleries, mounted on a concrete caisson, tower incorporating 2-story keeper's quarters. Solar-powered 155 mm lens (1985). Tower painted white, lantern black. Fog horn (blast every 15 s); the original fog bell is on display at the Lubec Historical Society Museum. One of D'Entremont's photos is at right, Janice Nolan Braud has a 2009 photo, Anderson has a page with fine photos, Trabas has Boucher's photo, Marinas.com has aerial photos, the Coast Guard has a historic photo, and Google has a satellite view. A "Save the Sparkplug" campaign saved the light from demolition in 1989. A $700,000 renovation by the Coast Guard in 1993-94 stabilized and restored the lighthouse, although the tower still leans at a 6° angle. In 2001 the lighthouse was repainted and repaired. 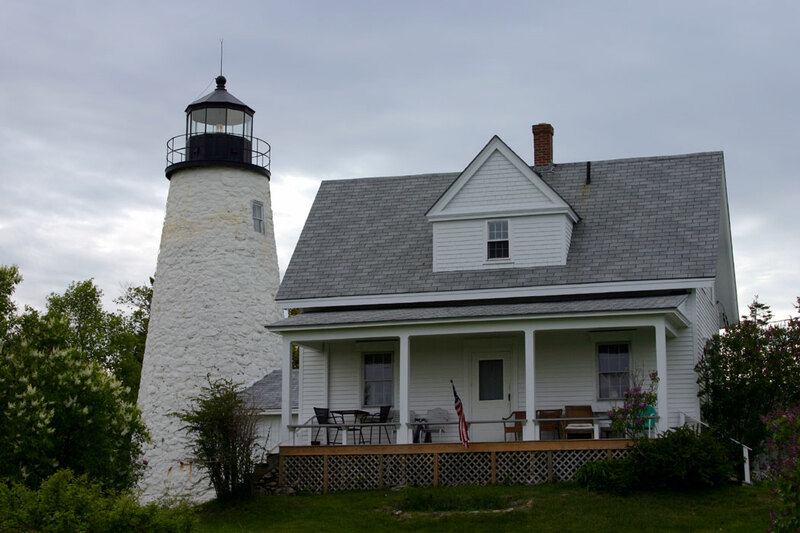 In 2006 the lighthouse was offered for transfer under the National Historic Lighthouse Preservation Act; when no preservation organizations qualified to take ownership it was sold in 2007 to Gary Zaremba, a restoration architect from New York. 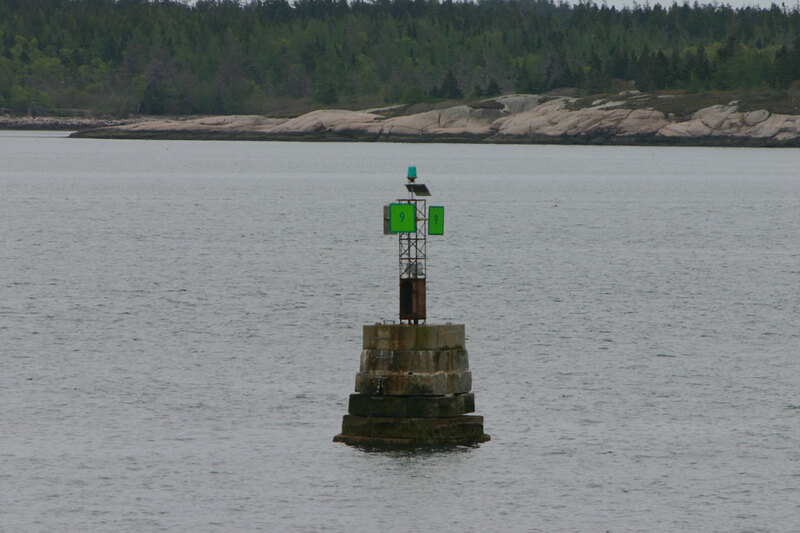 Located in the Lubec Channel south of Lubec. Accessible only by boat. Views from downtown Lubec and from many points on the shoreline nearby. Site and tower closed. Owner/site manager: private. Operator: U.S. Coast Guard. ARLHS USA-459; Admiralty H4161; USCG 1-0860. 1858 (station established 1808). Active; focal plane 83 ft (25 m); 2 white flashes every 15 s. 49 ft (15 m) "early classic" round brick tower, original 3rd order Fresnel lens. Tower painted with narrow horizontal red and white stripes, a pattern unique in the U.S.; lantern painted black with a red roof. Fog horn (2 blasts every 30 s). The original 1-1/2 story Victorian wood keeper's house was renovated in 2001-02 as a visitor center and museum. Brick fog signal building (1887) and oil house (1892). Terry Ross's photo is at the top of this page, Anderson has a good page for the lighthouse, Britten has a great photo, Trabas has a closeup photo, Marinas.com has aerial photos, Huelse has a historic postcard view, John Fansler has a closeup street view, and Google has a satellite view. Standing on the easternmost point of the United States, this is one of the best known of all American lighthouses and a familiar symbol of the Maine coast. 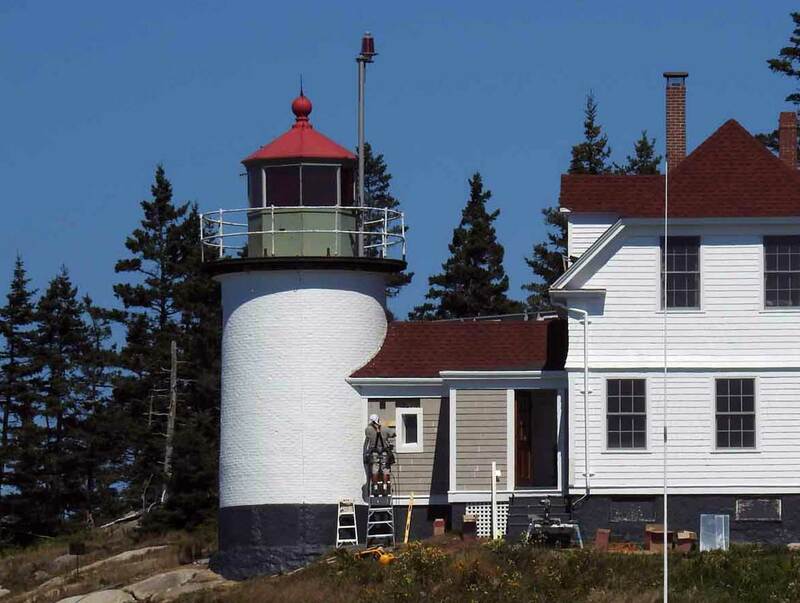 The West Quoddy Head Light Keepers Association works for preservation of the light station. The tower was repainted in 2003, and in 2004 the Coast Guard restored the lantern. Located south of Lubec, 4 miles (6.5 km) off ME 189, at the end of Quoddy Head Road. Site open (free), visitor center open daily late May to mid October, tower closed. Owner: Maine State Parks (Quoddy Head State Park) Operator: U.S. Coast Guard. 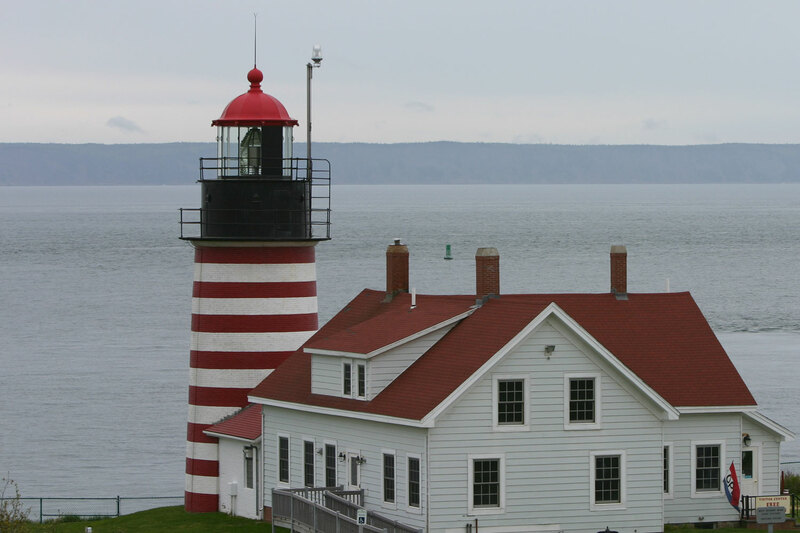 Site manager: West Quoddy Head Light Keepers Association . ARLHS USA-880; Admiralty H4162; CCG 038; USCG 1-1040. 1876 (station established 1847). Reactivated (inactive 1975-2001); focal plane 57 ft (17.5 m); white flash every 6 s. 41 ft (12.5 m) "Race Point" round cylindrical cast iron tower (brick lined) with lantern and gallery; VRB-25 aerobeacon. Tower painted white; lantern is gray. The 1-1/2 story Victorian wood keeper's house (1888) has been restored and is open for overnight stays. Brick oil house (1905). Fog horn (blast every 10 s). Original fog bell tower demolished, but the 1896 fog bell is on display in a traffic roundabout on ME 191 in Cutler. Anderson's page has photos, Trabas has Boucher's photo, Marinas.com has excellent aerial photos, and Google has a satellite view. The lighthouse was deactivated and replaced by a steel skeletal tower in 1975. In early 2000 the deteriorating light station was leased by the American Lighthouse Foundation and the Friends of Little River Lighthouse was organized. 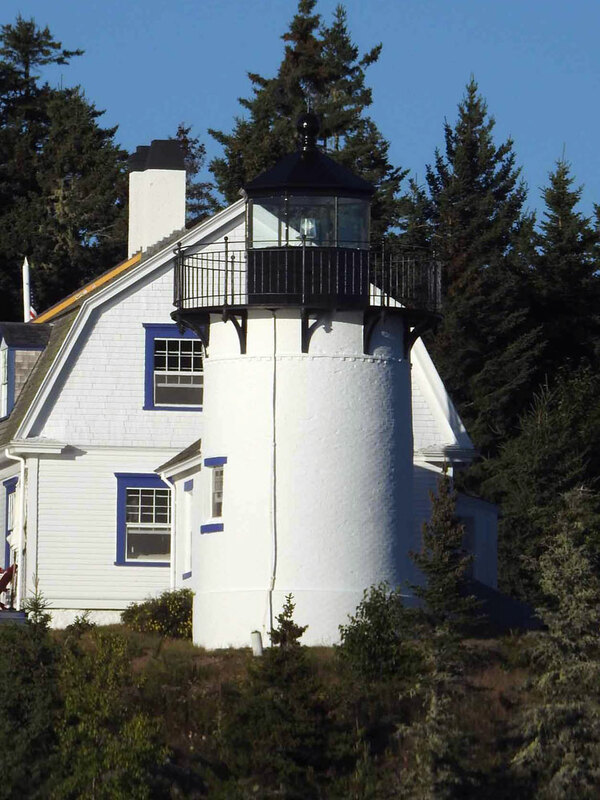 During 2001 the lighthouse was painted, the lantern windows were reglazed and caulked, and the wood in the lantern interior was replaced; this allowed the Coast Guard to return the light to the tower. In 2002 the lighthouse was transferred to ALF ownership and restoration of the keeper's quarters was underway. In 2006 Coast Guard volunteers painted the lighthouse. In July 2008 the keeper's house opened for overnight stays (mid June through late September). Located on an island in the mouth of Cutler Harbor. Accessible only by boat; Bold Coast Charters operates boat tours out of Cutler. Site closed in spring and early summer (bird nesting season), tower closed except for occasional open house tours. Owner: American Lighthouse Foundation. Site manager: Friends of Little River Light . Operator: U.S. Coast Guard. ARLHS USA-442; Admiralty H4164; CCG 005; USCG 1-1075. Date unknown (station established 1875). 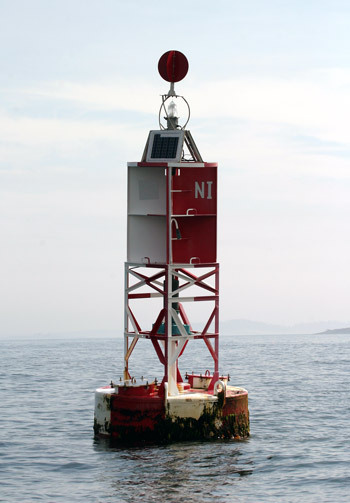 Active; focal plane 5 m (17 ft); white flash every 6 s. 4 m (13 ft) skeletal mast carrying a diamond-shaped red daymark. Down East magazine has a photo but the light is not seen clearly in Google's satellite view. The original lighthouse was a square tower with lantern and gallery centered on a square 1-story keeper's house. It deteriorated badly after being automated in 1934, and it was demolished in 1947. Located on a rocky islet in the middle of Machias Bay. Accessible only by boat. Site open, tower closed. ARLHS USA-024; Admiralty J0020; USCG 1-1145. 1822. Active; focal plane 91 ft (28 m); two white flashes every 20 s. 42 ft (13 m) old-style round granite tower with lantern and gallery attached to a small workroom; solar-powered VRB-25 optic. A 4th order Macbeth-Evans Fresnel lens believed to have been used here is on display at the Maine Lighthouse Museum in Rockland. Tower unpainted, lantern painted black; workroom is white with a red roof. Fog horn (blast every 15 s). Keeper's houses demolished; the brick fog signal building (1884) and oil house (1893) survive. A photo is at right, Lighthouse Digest has D'Entremont's article on the history of the light station, Anderson's page has photos, Ed Karjala has a photo, Trabas has Boucher's photo, Marinas.com has aerial photos, and Google has a satellite view. Maine's third oldest lighthouse got off to a rough start: it collapsed within a few months due to poor construction and had to be rebuilt. 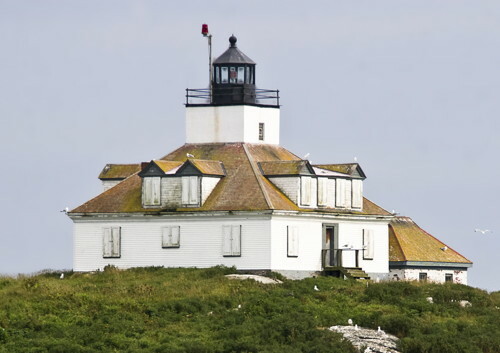 In 2000 the Coast Guard removed paint from the tower, revealing the original granite; a boat landing and a retaining wall were repaired and the light was converted to solar power. Located on an island in the mouth of Machias Bay. Accessible only by boat, and the island is closed April through August for the bird nesting season. Site and tower closed. Owner: U.S. Fish and Wildlife Service. Operator: U.S. Coast Guard. Site manager: Maine Coastal Islands National Wildlife Refuge. ARLHS USA-432; Admiralty J0024; USCG 1-1120. 1851 (station established 1827). Active; focal plane 72 ft (22 m); white flash every 30 s. 57 ft (17.5 m) round brick tower with lantern and gallery; solar-powered DCB-24 aerobeacon. Tower painted white, lantern and watch room black. Fog horn (2 blasts every 30 s). The keeper's house was demolished in 1982 in a military demolition exercise; the lighthouse was slightly damaged in the explosion. Brick fog signal building (1912). Anderson's page has photos, Trabas has Boucher's photo, Marinas.com has aerial photos, Huelse has a historic postcard view that shows the original configuration of the station, and Bing has a satellite view. This lighthouse resembles the Sankaty Head Light in Massachusetts; it is one of the first "early classic" style masonry towers. The height of the tower was increased in 1886 by adding a watch room below the lantern. Prisms of the 2nd order Fresnel lens (1856) have been restored by volunteers from the Chesapeake Chapter of the U.S. Lighthouse Society. The lens was to be displayed at the Maine Maritime Museum in Bath, but the hardware needed to assemble the lens has not been located. The lighthouse was refurbished and converted to solar power in 1999. In 2010 a preservation group called Keepers of Moose Light was formed to seek ownership of the lighthouse. The application was rejected because the group did not have a substantial source of funds in hand, so the lighthouse was scheduled to be sold at auction. In January 2013 it was sold for $93,500 to Donald J. Vaccaro of South Glastonbury, Connecticut. His plans for the property were not known. Located on Mistake Island, a small island about 5 miles (8 km) southeast of Jonesport. The island is a nature preserve (part of the Great Wass Island Preserve) managed by the Maine Nature Conservancy. Accessible only by boat. Site status unknown. Operator: U.S. Coast Guard. Owner/site manager: private. ARLHS USA-513; Admiralty J0028; USCG 1-1390. Date unknown. Active; focal plane 8 m (26 ft); green flash every 4 s. 8 m (26 ft) square skeletal mast on a square stone tower. The mast also carries square green daymarks. Trabas has a photo and Google has a satellite view. This one of more than a dozen 19th century stone daybeacons on the coast of Maine; we do not know when the light was added. Located off Kelly Point, about 5 km (3 mi) east of Jonesport. Accessible only by boat. Site open, tower closed. Owner/site manager: U.S. Coast Guard. Admiralty J0030; USCG 1-1305. 1873 (station established 1838). Inactive since 1982; charted as a landmark. 29 ft (9 m) square pyramidal brick tower with lantern and gallery, attached to a small brick workroom; buildings painted white, lantern and gallery black. The keeper's house and all other light station buildings were demolished following automation of the light in 1958; foundation ruins remain. Anderson has a fine page with several photos, Karl Agre has a photo, Huelse has a historic postcard view showing the original keeper's house and fog bell tower, the Coast Guard has a historic photo, and Google has a satellite view. The tower is a sibling of Burnt Coat Harbor Light (see the Southern Maine page). The light was replaced by a lighted whistle buoy offshore. 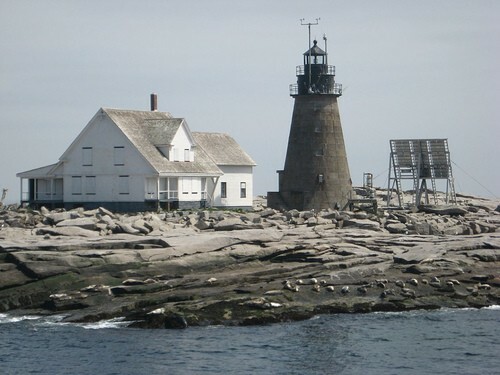 In 1997 a local support group was granted ownership under the Maine Lights program and began repairing the lighthouse. The brickwork and windows have been restored, the tower has been painted, and restoration work has begun in the interior. Lighthouse Digest has a 2002 article on early restoration work, and Anderson's page has photos showing scaffolding around the tower. The island, part of Maine Coastal Islands National Wildlife Refuge, is an important seabird nesting site and is closed to the public April through August. Located about 3 miles (5 km) southwest of South Addison. Accessible only by boat. Visible from boat tours from Milbridge. Site and tower closed. 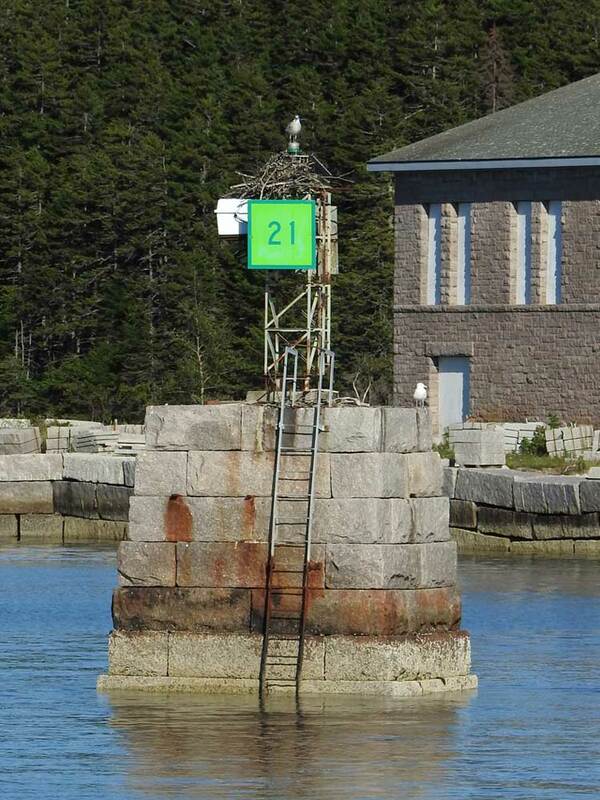 Owner/site manager: Friends of Nash Island Light. ARLHS USA-527; USCG 1-1510. 1853. Inactive since 1934; charted as a landmark. 31 ft (9.5 m) round cylindrical granite tower with lantern and gallery, painted white; lantern black. The 1-1/2 story Victorian wood keeper's house (1875) is privately owned. A brick workroom joining the tower to the keeper's quarters was added in 1887. Oil house (1905). 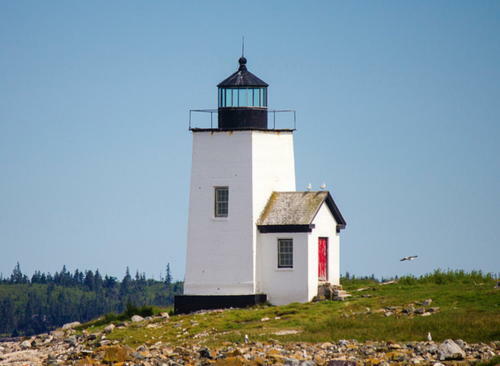 Not to be confused with the Pond Island Light in the mouth of the Kennebec (see below). Anderson's page has a good photo, Huelse has a historic postcard view, and Google has a satellite view. The light was replaced by a lighted bell buoy offshore. Located on the southeast corner of Pond Island off Tom Leighton Point, about 5 miles (8 km) south of Milbridge at the entrance to Narraguagus Bay. The lighthouse and the entire island are privately owned. Visible from boat tours from Milbridge. Site and tower closed. Owner/site manager: private. ARLHS USA-526; USCG 1-1635. 1855 (station established 1817). Active; focal plane 123 ft (37.5 m); white flash every 10 s. 119 ft (36 m) round granite tower with lantern and double gallery; VRB-25 aerobeacon. 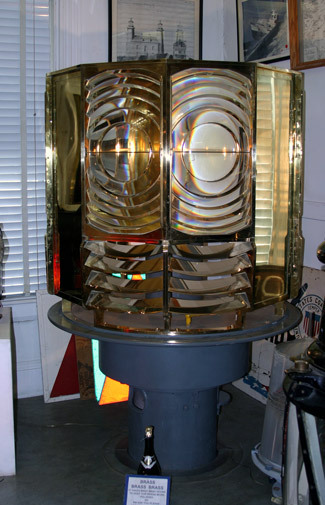 The original 2nd order Fresnel lens is on display at the Maine Lighthouse Museum in Rockland. Tower unpainted; lantern painted black. 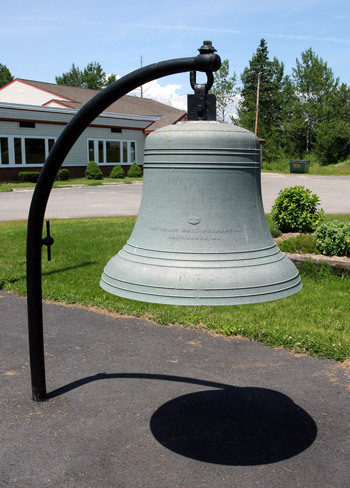 Fog horn (blast every 30 s); a fog bell formerly used here is on display at the elementary school in Milbridge. The 1-1/2 story Victorian wood keeper's house (1875) provides seasonal housing for Fish and Wildlife Service staff and students from the College of the Atlantic. Brick fog signal building (1887), oil house, engine house, and other buildings. Brian Bell's photo is at right, Anderson's page has photos, Wikimedia has an excellent photo, Trabas has Boucher's photo, Marinas.com has good aerial photos, Huelse has a historic postcard view, and Google has a satellite view. The second-tallest Maine lighthouse, this handsome tower is a sibling of Boon Island Light (see the Southern Maine page). The lighthouse was repaired and restored by Campbell Construction in 1997-98. In March 2001 the light was out of service for two months when a nor'easter damaged the submarine power cable to the island. As a result, the light was converted to solar power later in the year. 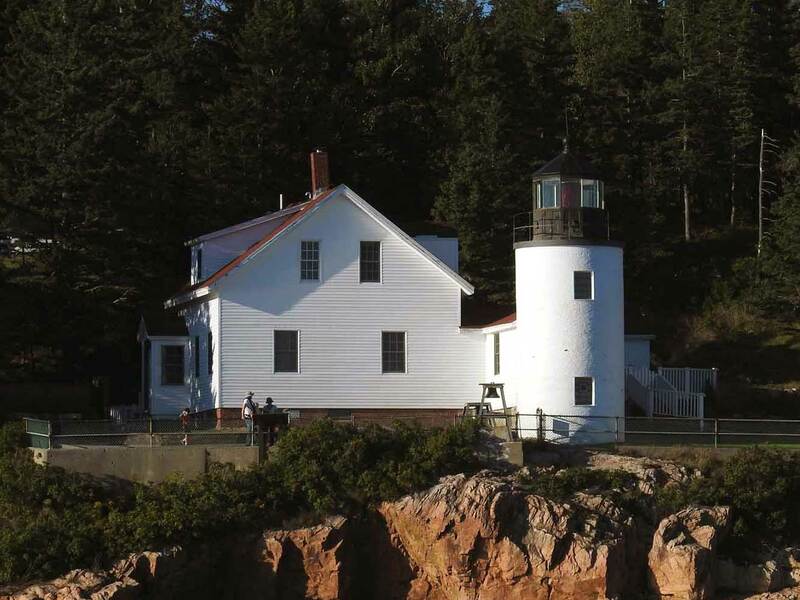 In 2004 the light station was listed for transfer under the National Historic Lighthouse Preservation Act and in late 2006 ownership was transferred to the Fish and Wildlife Service. Located on a small island off Petit Manan Point. There are hiking trails leading to Petit Manan Point and providing a view of the lighthouse. Also visible from boat tours from Milbridge. Accessible only by boat. Site open September through March (closed for bird nesting season), tower closed. Owner: U.S. Fish and Wildlife Service. Operator: U.S. Coast Guard. Site manager: Maine Coastal Islands National Wildlife Refuge. ARLHS USA-597; Admiralty J0034; USCG 1-1735. 1891 (station established 1850; inactive from 1860s to 1891). Active; focal plane 42 ft (13 m); red flash every 6 s (two white sectors cover safe routes). 38 ft (11.5 m) round shingled wood tower with lantern and gallery; 250 mm lens (1951). Tower painted white, lantern black. The 1-1/2 story wood farmhouse-style keeper's house is used as a U.S. Navy guesthouse known as Gull Cottage. Stone oil house (1905). Brent Danley's photo is at right, Anderson's page has good photos, Trabas has a photo by Boucher, and Google has a satellite view. The tower was reshingled, repainted, and restored by the Coast Guard in 1999-2000. 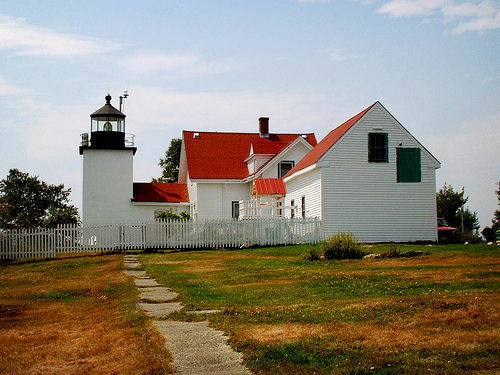 In 2000 the light tower was leased to the American Lighthouse Foundation for preservation; ALF has a page for the lighthouse. In fall 2001 the stairway was restored. In 2004 the lantern was removed and restored and water damage in the tower was repaired. 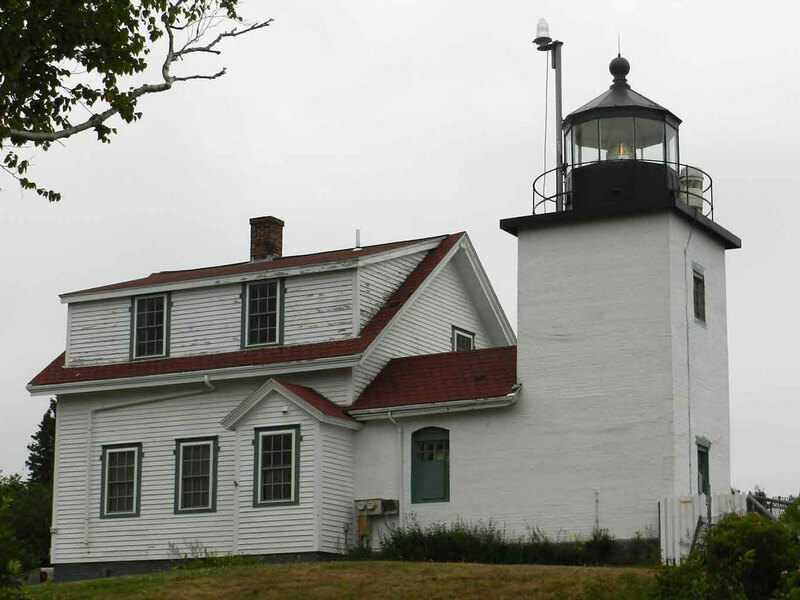 In the spring of 2006 the windows were replaced, thanks to a grant from the New England Lighthouse Lovers. However, there is a critical need for repairs to the wooden spiral stairs. Located on Lighthouse Road off ME 195 in Prospect Harbor. Good view from ME 186 on the west side of the harbor. Site and tower closed; there's a distant view from highway 186 across the harbor. Owner: U.S. Coast Guard (tower only) and U.S. Navy. Operator: U.S. Coast Guard. Site manager: U.S. Naval Satellite Operations Center. ARLHS USA-674; Admiralty J0038; USCG 1-1785. 1856. Inactive since 1933; charted as a landmark. 19 ft (6 m) round brick tower with lantern and gallery, attached by a brick workroom to a 2-story Victorian wood keeper's house (1876). Tower painted white, lantern black. Stone oil house (1905). Anderson's page has several photos and Google has a satellite view. The lighthouse was replaced by a lighted bell buoy. The light station was sold as a private residence in 1934. In 1995 novelist and retired banker William C. Holden bought the lighthouse and restored it, putting it in excellent condition. Holden sold the lighthouse in 2004, and the present owners are not known. Holden has written a memoir, Mark Island Lighthouse Diaries: Songs of a Dreamer, about his experience as a lighthouse owner. Located on Mark Island in the mouth of Winter Harbor. 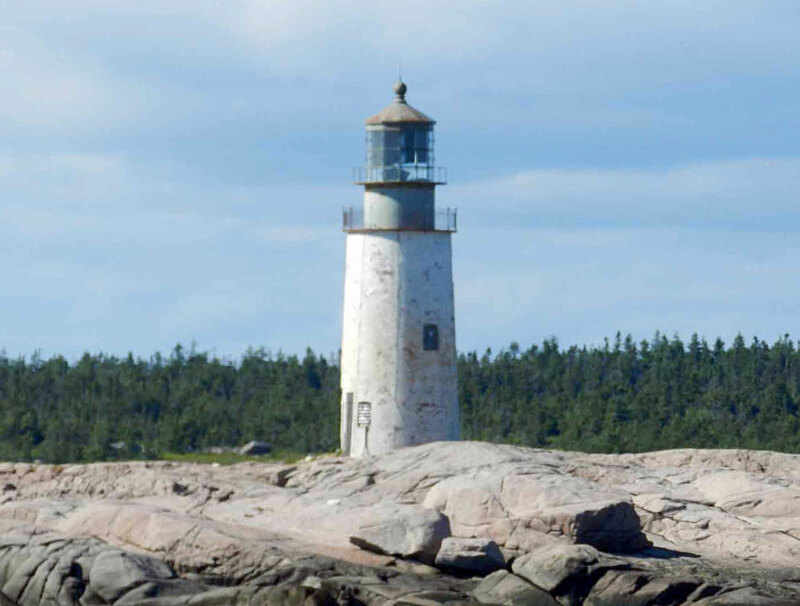 Accessible only by boat; lighthouse cruises, available daily in season from Bar Harbor, pass the lighthouse, and it is visible from Schoodic Road on the west side of the Schoodic Peninsula in Acadia National Park. Site and tower closed. Owner/site manager: private. ARLHS USA-900; USCG 1-1915. 1875. Active; focal plane 64 ft (19.5 m); red flash every 5 s. 40 ft (12 m) square cylindrical brick tower with lantern and gallery, rising through the center of the roof of a 1-1/2 story wood keeper's house. The original lantern was removed in 1976; the VRB-25 aerobeacon is mounted in a replica lantern (1986). Building painted white with red roof; lantern is black. Brick fog signal building (1904), oil house, and other buildings. Active fog horn (2 blasts every 30 s). Liz West's page is at right, Deb Snelson has a nice 2007 photo, Anderson's page has several photos, Trabas has Boucher's photo, Marinas.com has aerial photos, and Google has a satellite view. 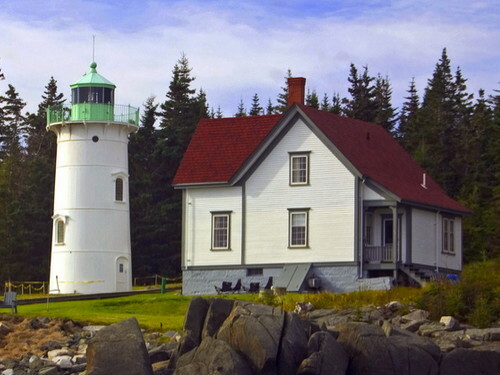 The design of this integral lighthouse is very unusual for Maine. The lantern was removed in 1976 when a rotating aerobeacon was installed. This led to public protests and in 1986 the Coast Guard installed a new lantern similar to the original. In the late 1990s the station was transferred to the Fish and Wildlife Service under the Maine Lights program. Fish and Wildlife completed a restoration of the exterior of the building in 2015; the roof was repainted the traditional red. 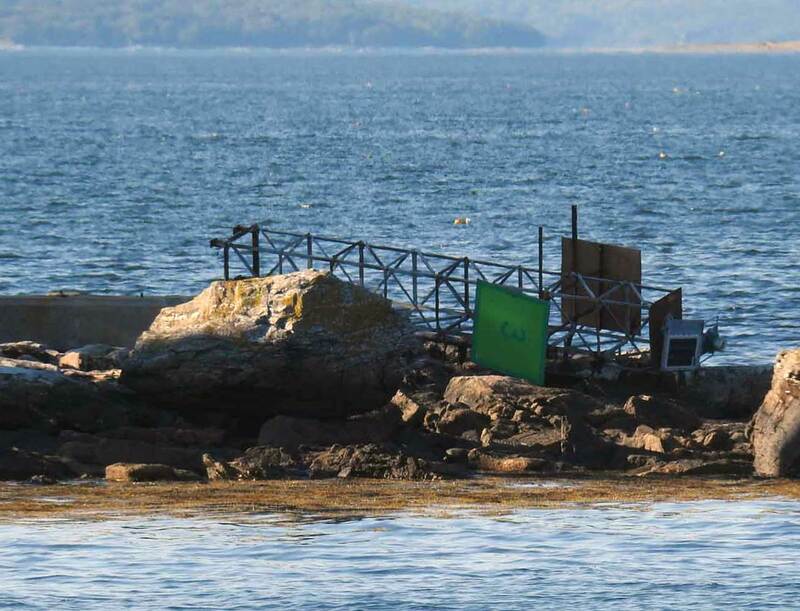 Located on an island in the mouth of Frenchman Bay about 4 miles (6.5 km) southeast of Bar Harbor. Accessible only by boat. Boat tours, available daily in season from Bar Harbor, pass the lighthouse. Site open September through March (closed for bird nesting season), tower closed. Owner: U.S. Fish and Wildlife Service. Operator: U.S. Coast Guard. Site manager: Maine Coastal Islands National Wildlife Refuge. ARLHS USA-268; Admiralty J0040; USCG 1-1865. 1855 (station established 1828). Reactivated (inactive 1955-1957 and 2002-? 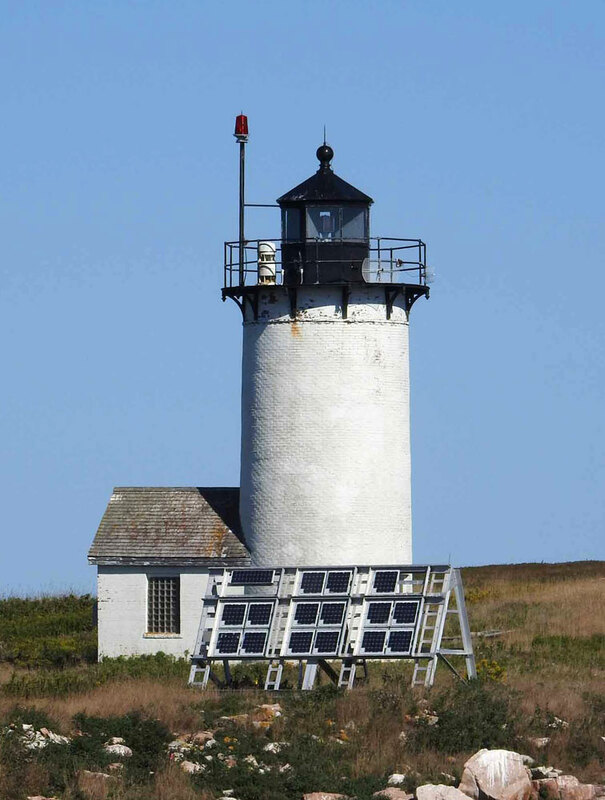 ); focal plane 105 ft (32 m); white flash every 10 s. 43 ft (13 m) round cylindrical brick tower with lantern and gallery, adjacent (formerly attached) to a 1-1/2 story wood Cape Cod style keeper's house; solar-powered 300 mm lens. 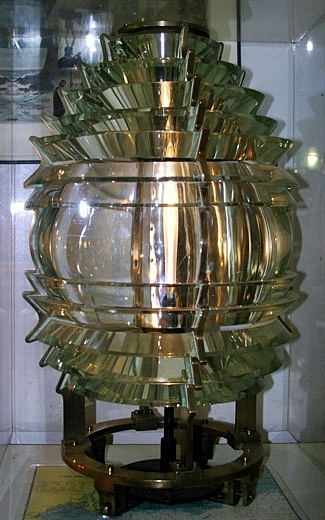 The original 4th order Fresnel lens is on display in the Fisherman's Museum at Pemaquid Point Light. Tower painted white, lantern black. Brick oil house (1895) and shingled fuel house (1905). Harvey Barrison's photo is at right, Anderson also has a good page for the lighthouse, Trabas has Boucher's photo, and Google has a satellite view. A typical Maine lighthouse of its period. Growth of trees having made the light difficult to see from the water, the Coast Guard proposed to discontinue it in 1991 and again in 1997, but this was opposed by residents and by mariners. The Coast Guard and National Park Service reached a standoff, unable to agree how trees might be cut to restore visibility of the light without damaging natural values on the island. In 2002 the lighthouse was replaced by an offshore buoy. Lighthouse Digest has an April 2002 report on the situation. In 2003 the park service replaced the roof of the keeper's quarters. Sometime before 2007 the light was once again placed in service, although it continued to be obscured to a great extent by trees. 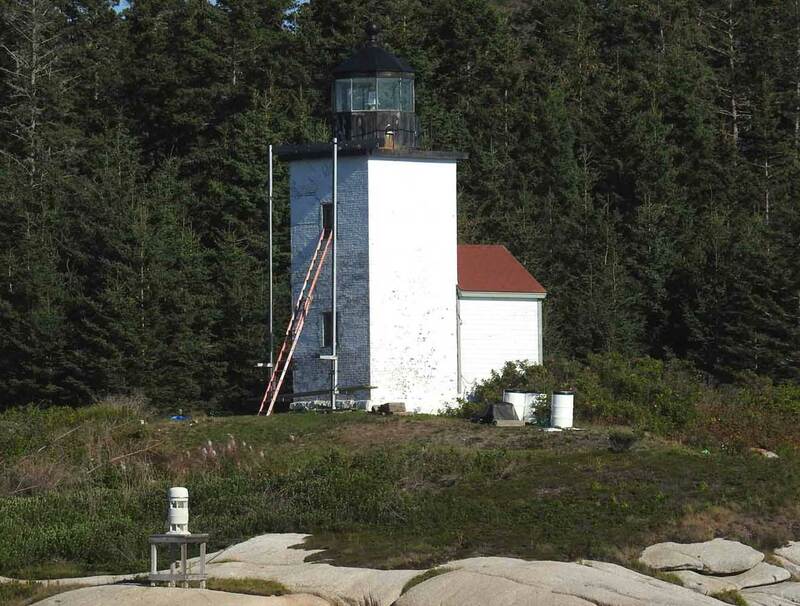 In 2008 the lighthouse was made available for transfer under NHLPA and it was later transferred to the National Park Service. A project in 2012-13 cleared many trees, making the light more visible and reducing the danger of fire. 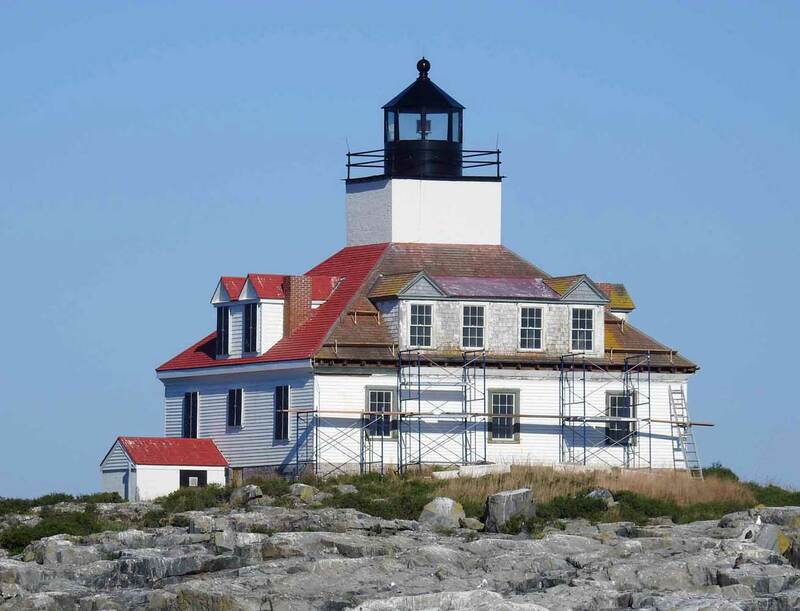 The park service estimates that restoration of the lighthouse will require at least $800,000. In 2017 the Friends of Acadia made the lighthouse its annual fundraising target and raised $240,000 for the restoration effort. 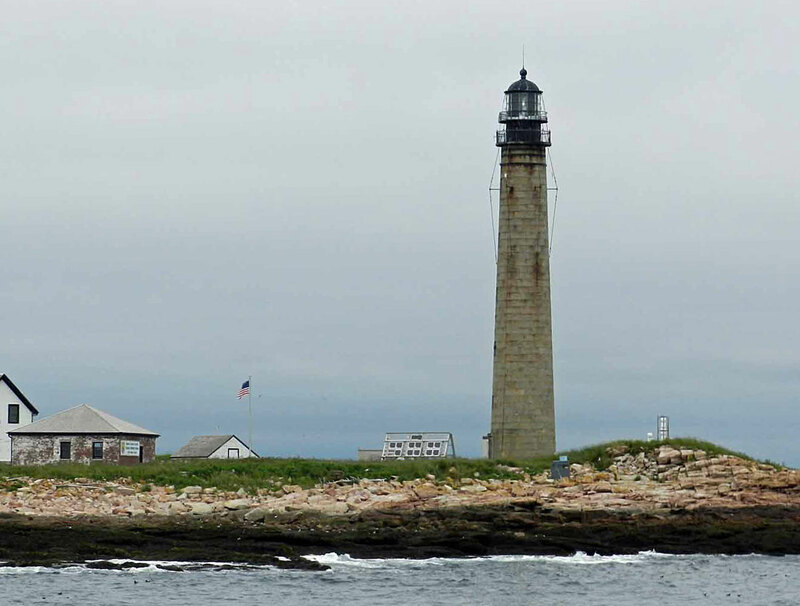 The Keepers of Baker Island work for the preservation of the light station and the island's ecology. Bar Harbor Whale Watch offers tours to the island daily in July and August and on selected dates in June and September. Located in the center of Baker Island southeast of Islesford. Site open, tower closed. Operator: U.S. Coast Guard. Owner/site manager: U.S. National Park Service (Acadia National Park). ARLHS USA-028; Admiralty J0046; USCG 1-2045. Date unknown (before 1870). Daybeacon, never lighted. Approx. 6 m (20 ft) square granite pyramid, painted white. Bill Comstock has a 2011 photo and Google has a satellite view. Located on a rocky reef in the Eastern Way passage halfway between Little Cranberry Island and Mount Desert Island. Accessible only by boat. Site open. USCG 1-2070. 1889 (station established 1839). Reactivated (inactive 1981-1989; now maintained by the National Park Service); focal plane 100 ft (30.5 m); white flash every 5 s. 31 ft (9.5 m) round cylindrical brick tower with lantern and gallery. Tower painted white, lantern black. The original 1-1/2 story gambrel-roofed wood keeper's house is leased by the National Park Service to a summer resident caretaker. Stone oil house (1905). A photo by Dana Moos is at the top of this page, Anderson's page has several photos, Trabas has Boucher's photo, Wikimedia has a closeup, Marinas.com has aerial photos, Huelse has a historic postcard view, and Google has a satellite view. In 1981 the lighthouse was deactivated and replaced by two lighted bell buoys offshore. Ownership was transferred to the National Park Service in 1987. 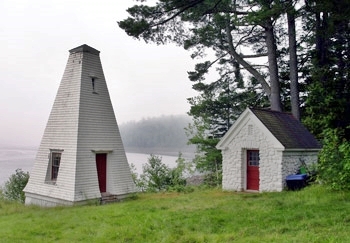 The light station was restored by efforts of the Friends of Acadia and tower was relit as a private aid in 1989. The leaseholders since 1989, Martin Morad and Fabiola Martens, have also worked to maintain and restore the property. Located atop a bluff on a small island southeast of the Northeast Harbor entrance. Ferries from Northeast Harbor to Islesford and lighthouse cruises, available daily in season from Bar Harbor, pass the site. Accessible only by boat. Site and tower closed. Owner: U.S. National Park Service. Site manager: Acadia National Park. ARLHS USA-045; Admiralty J0045; USCG 1-2105. 1858. Active day and night; focal plane 56 ft (17 m); red light occulting every 4 s. 32 ft (10 m) round cylindrical brick tower with lantern and gallery; 4th order Henry Lepaute Fresnel lens (1902). Tower painted white, lantern black. The 1-1/2 story wood keeper's house was in use as Coast Guard housing until recently. Square pyramidal brick bell tower (1898), bell removed. Brick oil house (1902). 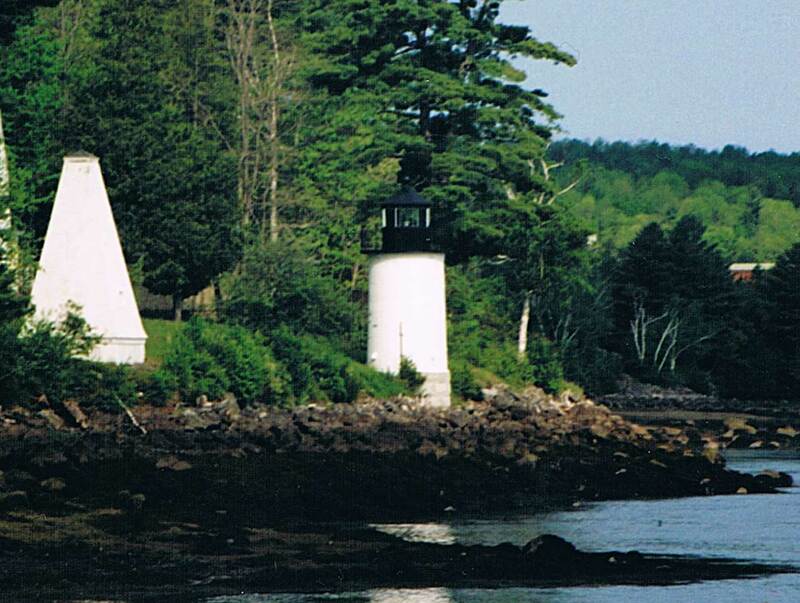 A picturesque site and lighthouse, familiar to visitors to Acadia National Park. The Coast Guard has maintained the station in good condition. Michael Rowlett's photo is at right, Anderson also has a good page for the lighthouse, Trabas has a photo by Boucher, Lighthouse Digest has a June 2006 feature article on the station, Marinas.com has aerial photos, Joshua Torrey has a closeup street view, Joe Zimmerman has a street view from the beach, and Google has a satellite view. 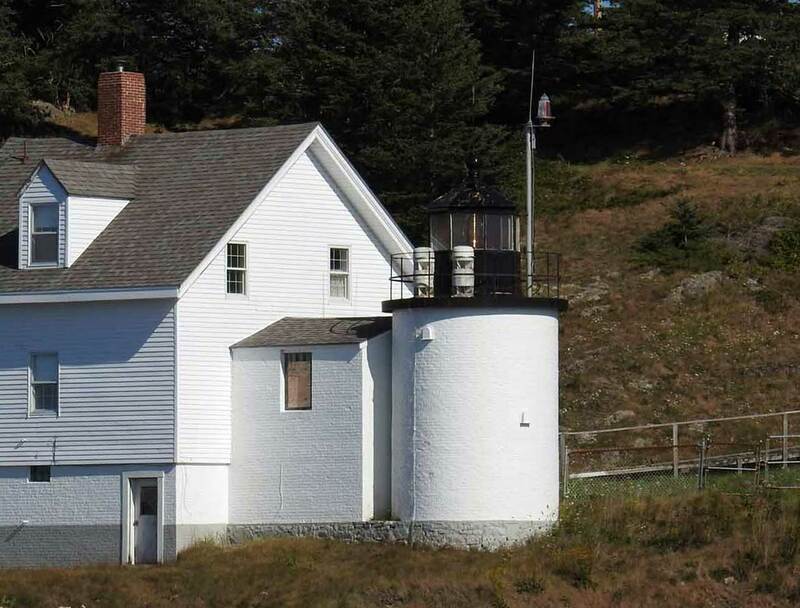 In 2017 the National Park Service agreed to take ownership of the light station. Possible uses are under consideration but limited parking is an issue (currently only 27 parking spaces are available). 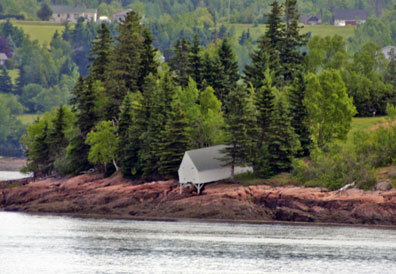 Located at the end of Lighthouse Road, off ME 102A in Bass Harbor. Site open (parking available but will be crowded in season), tower closed. Owner/site manager: U.S. Coast Guard. ARLHS USA-041; Admiralty J0054; USCG 1-2335. 1890. Active; focal plane 67 ft (20 m); red flash every 5 s. 42 ft (13 m) round cylindrical granite tower with lantern and gallery; solar-powered VRB-25 aerobeacon (1986). Tower painted white, lantern black. Fog horn (blast every 15 s) operates continuously. The original 1-1/2 story wood keeper's house is in use as an ecology research facility known as the Alice Eno Biological Station. The brick fog signal building (1890) was renovated in 1994 by the Maine Nature Conservancy. Original boathouse, oil house (1901), and other light station buildings. Anderson's page has several good photos, Trabas has Boucher's photo, Lighthouse Digest has D'Entremont's article on the light station and feature by Robyn Haas on former keeper Dalton Reed; Marinas.com has aerial photos, and Google has a satellite view. The station is the base for field courses of the College of the Atlantic, which took ownership in 1998 under the Maine Lights program. Located at the south end of an isolated island northeast of Frenchboro; most of the island is a Maine Nature Conservancy preserve. Accessible only by boat; lighthouse cruises, available daily in season from Bar Harbor, pass the lighthouse Site and tower closed. Operator: U.S. Coast Guard. Owner/site manager: College of the Atlantic (Island Research Center). ARLHS USA-347; Admiralty J0052; USCG 1-2295. 1847 (Alexander Parris); station established 1830. Active; focal plane 75 ft (23 m); white flash every 15 s. 58 ft (17.5 m) round old-style granite tower (raised 10 ft (3 m) in 1857) with lantern and gallery; solar-powered VRB-25 aerobeacon (1993). Tower unpainted; lantern painted black. Fog horn (2 blasts every 30 s). NOAA C-MAN automatic weather station. 1-1/2 story wood keeper's quarters (1893). A photo is at right, Anderson has a good page for the lighthouse, Lighthouse Digest has information on the history of the light station and a feature article on the difficulties of life there, and Huelse has a historic postcard view, but the skerry is not seen in Google's satellite view. 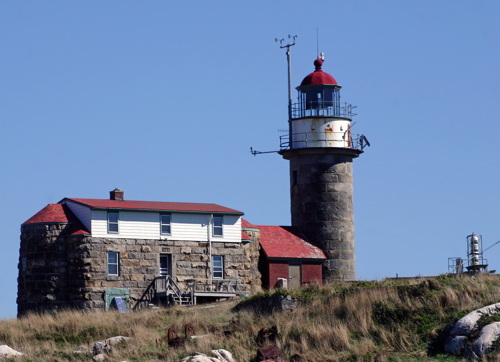 A remarkable and historic site and one of the most isolated and exposed light stations of the U.S. Atlantic coast. The lighthouse is one of three waveswept towers designed by the architect Alexander Parris. 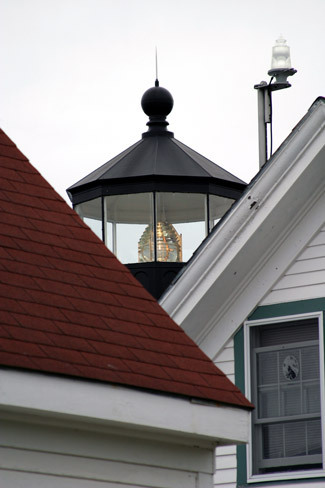 The original bird-cage lantern was replaced with a new lantern and 3rd order Fresnel lens in 1858. Both were removed in the 1970s and replaced with rotating aerobeacons. As a result of preservationists' complaints and recurring weather damage, the aerobeacons were removed and the present lantern installed in 1985. The station was transferred to the College of the Atlantic in 1998 under the Maine Lights program. The keeper's house is in use as an ecology research facility known as the Edward McC. Blair Marine Research Station. The college replaced the roof of the keeper's house in 2000. In 2001 the generator house was expanded by the addition of a second floor; the first floor is now a marine lab and the second floor is a classroom. In August 2009 Hurricane Bill damaged several of the buildings and nearly destroyed the boathouse; the lighthouse was not damaged. In April 2014 the Mars family donated $425,000 to restore and upgrade the station. The station is known especially for finback and humpback whale research. Located on a bare rocky island south of Frenchboro. Accessible only by boat. Site and tower closed. Operator: U.S. Coast Guard. Owner/site manager: College of the Atlantic (Island Research Center). This is the very first lighthouse in the USCG Light List. ARLHS USA-516; Admiralty J0048; USCG 1-0005. 1872. Active; focal plane 75 ft (23 m); white light occulting every 4 s. 32 ft (10 m) square pyramidal brick tower with lantern and gallery; solar-powered 250 mm lens. Tower painted white, lantern black. Original 1-1/2 story wood keeper's quarters. Brick oil house (1895) and wood bell tower (1911). The bell tower, originally a tall pyramid, was cut down to its present height in about 1965-70 when the ringer was electrified (the bell is no longer in use). This lighthouse was originally the rear light in a range. D'Entremont has a fine web site for the light station, Anderson's page has several good photos, Robert English has a 2007 closeup photo, Trabas has Boucher's photo, Marinas.com has aerial photos, David Lewis has a street view, and Google has a satellite view. The light station is owned and maintained by the Town of Swan’s Island and is adjacent to a town park with 1.8 miles of trails. The town replaced the shingle siding of the bell tower in 2001 and used a grant in 2002 for an architectural study of preservation options and requirements. Restoration of the light station buildings has been moving forward since 2006 with the help of a number of grants and many individual contributions. Restoration of the tower interior was completed in the fall of 2015. The major remaining piece of the restoration project is repair of the masonry light tower, scheduled for 2019 and funded in part by an $85,000 National Maritime Heritage grant. The Friends of the Swans Island Lighthouse (FOSIL) work for the preservation of the light station. An upstairs apartment in the keeper's house is available for vacation rental. Located atop Hockamock Head at the end of Harbor Road on the south side of Swans Island. Swan's Island is accessible by state ferry from Bass Harbor; the light station is about 3.5 miles from the ferry landing. Site open except in icy conditions, keeper's house and tower open Tuesday through Saturday during the summer season; check the station's web site for current schedule information. Operator: U.S. Coast Guard. Owner/site manager: Town of Swans Island. ARLHS USA-096; Admiralty J0058; USCG 1-2700. 1857. Inactive since 1933. 22 ft (6.5 m) round cylindrical brick tower with lantern and gallery. 5th order Fresnel lens still mounted in tower. Tower painted white, lantern black. The 1-1/2 story wood keeper's house is in use as a private summer residence. Brick oil house (1905). The active light (focal plane 25 ft (7.5 m); green flash every 4 s) on a 6 m (20 ft) square skeletal mast. Anderson has a good page for the lighthouse and Google has a satellite view. The buildings were restored in the late 1970s by Wilbur and Edith Trapp, the owners at that time. 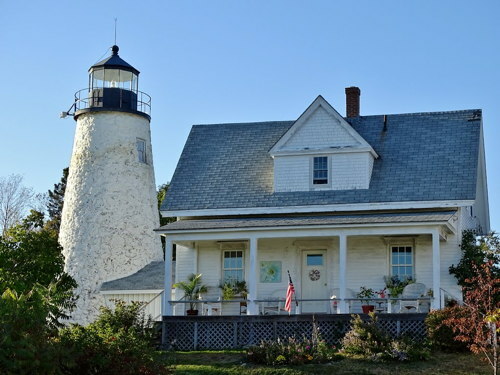 The Trapps sold the light station in 1995 to Jim and Alice Ann Madix. In August 2016 the owners put the island and lighthouse on sale for $795,000; the price was reduced to $650,000 in June 2017. As of March 2019 the property is off the market but it's not known if it was sold. The active light tower collapsed in 2016 but the Coast Guard has replaced it. Located on tiny Green Island in Blue Hill Bay a little over three miles (5 km) southeast of Brooklin. Accessible only by boat. Site and tower closed. Owner/site manager: private. ARLHS USA-064. Active light: Admiralty J0056; USCG 1-2595. Date unknown. Active; focal plane 6 m (20 ft); green flash every 4 s. 6 m (20 ft) square solid stone pyramid with a light on a short post at the apex. Trabas has Boucher's photo and Google has a satellite view. This one of more than a dozen 19th century stone daybeacons on the coast of Maine; we do not know when the light was added. Located opposite Allen Cove, about 1 km (0.9 mi) southwest of Stonington. Accessible only by boat. Site open, tower closed. Admiralty J0072; USCG 1-3070. 1858. Active; focal plane 52 ft (16 m); white flash every 6 s. 25 ft (7.5 m) square cylindrical brick tower with lantern and gallery, painted white, attached to a small workshed. Solar-powered 250 mm lens (1960). Fog horn (blast every 15 s) operates continuously. 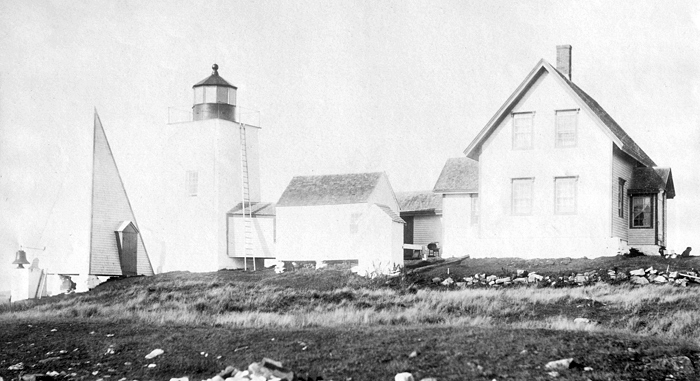 The keeper's house burned in 1959, and the other light station buildings were then demolished. A photo by D'Entremont is at right, Anderson's page has several photos, Trabas has Boucher's photo, Robert English has a good photo, Huelse has a historic postcard view that shows the keeper's house, and Google has a satellite view. 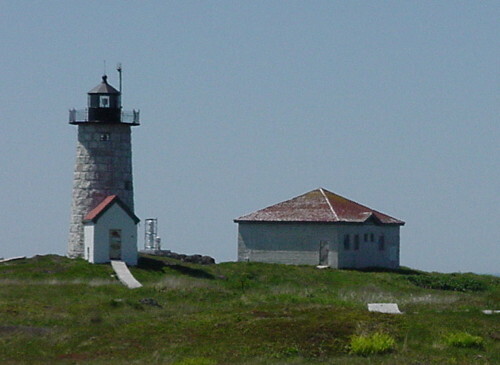 In 1998 the lighthouse was transferred to the Island Heritage Trust, which works for conservation and historic preservation of sites in the Deer Island area. In 2014 the Trust began a project to repair and repaint the lighthouse; it was seeking $19,000 to fund part of this project. The island is managed as a bird sanctuary. Located on Mark Island in East Penobscot Bay about two miles southwest of Stonington. Accessible only by boat. Site and tower closed (bird sanctuary). Operator: U.S. Coast Guard. Owner/site manager: Island Heritage Trust (Mark Island Lighthouse). ARLHS USA-221; Admiralty J0073; USCG 1-3095. 1838. Active; focal plane 106 ft (32.5 m); white flash every 4 s. 30 ft (9 m) round granite rubblestone tower with lantern and gallery, painted white. Despite protests from area residents, the keeper's house was demolished in 1964. The square pyramidal wooden fog signal tower survives. 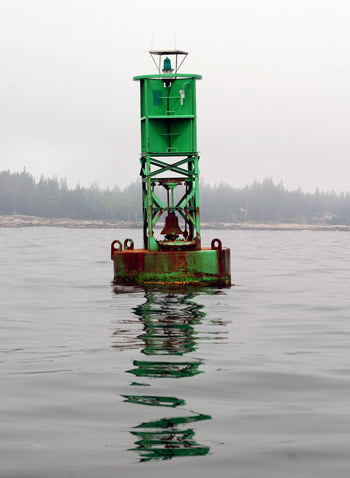 When the Coast Guard removed the fog bell, it fell in the sea; a local lobsterman later salvaged it, and it is on display on Great Spruce Head Island. Anderson's page has great photos of the station, Trabas has a commercial photo, and Google has a satellite view. 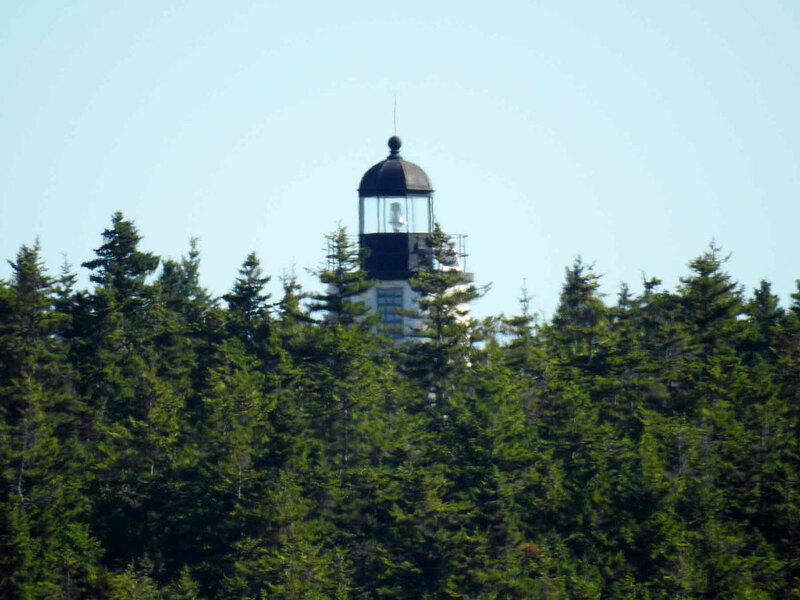 In June 2000 the Coast Guard announced its intention of discontinuing the light, which has become difficult to see due to the growth of trees on the island. There wer objections and the light has remained in service. In 2018 the J.B. Leslie Camplany completed a restoration of the lighthouse. Located at the northeastern tip of Eagle Island, west of Deer Isle in East Penobscot Bay. Accessible only by boat. Site open, tower closed except during an annual open house in August. Operator: U.S. Coast Guard. Owner/site manager: Eagle Light Caretakers. ARLHS USA-256; Admiralty J0078; USCG 1-3455. 1854. Inactive since 1933 (charted as a landmark). 28 ft (8.5 m) round cylindrical brick tower with lantern and gallery, attached to 1-1/2 story wood keeper's house. Buildings painted white, lantern and gallery black. Brick oil house (1906) and boathouse. Anderson's page has several photos, D'Entremont has a good photo, Marinas.com has aerial photos, and Google has a satellite view. The station has been a private residence since 1934. Located on a small island in Eggemoggin Reach off the northwestern tip of Little Deer Isle. Visible from the end of Eggemoggin Road off ME 15 on Little Deer Isle. Site and tower closed. Owner/site manager: private. ARLHS USA-677. 1829. Reactivated (inactive 1937-2008); focal plane 134 ft (41 m); white flash every 6 s. 51 ft (15.5 m) old-style round granite rubblestone tower with lantern and gallery. Tower painted white; lantern is black. Oil house (1895) and barn. B.A. Bartlett's photo is at right, Anderson's page has photos, Trabas has a fine closeup, Huelse has a historic postcard view, and Google has a street view and a satellite view. The original 1-1/2 story wood keeper's house was gutted by fire in April 1999. The tower was not damaged by the fire. In 2000 the town restored the keeper's quarters as a residence; it is leased to a caretaker. 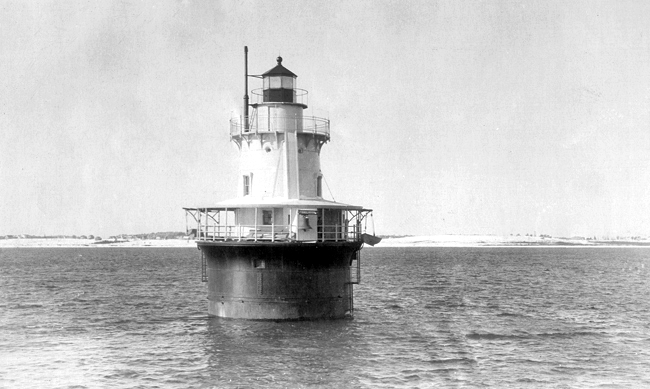 The active light was moved to a skeletal tower near the bottom of the bluff in 1937. In September 2007 the skeletal tower was nearly destroyed by a fierce nor'easter. 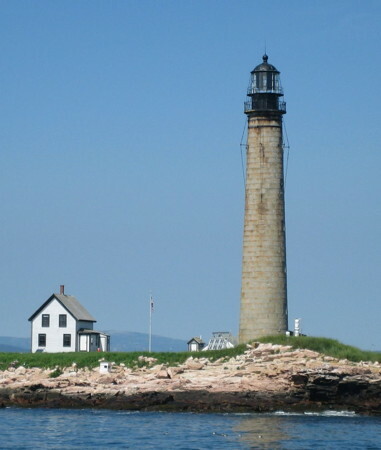 In late October a town meeting unanimously approved a request from the Coast Guard to restore the light to the lighthouse, and the tower was relit on 31 January 2008. Located atop a 100 ft (30 m) bluff on Dyces Head Road (extension of Battle Avenue) in Castine. Limited parking available. Site open, tower closed. Operator: U.S. Coast Guard. Owner/site manager: Town of Castine. ARLHS USA-231; Admiralty J0082; USCG 1-3530. Note: Isle au Haut, Vinalhaven Island, Matinicus Island, and surrounding smaller islands in the mouth of Penobscot Bay are included in Knox County along with a large area of the mainland on the west coast of the bay. 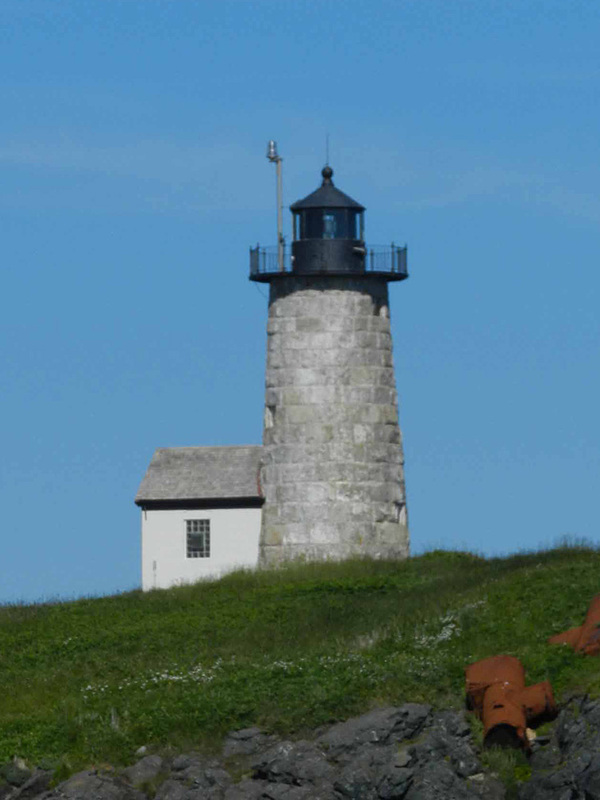 For other lighthouses of Knox County, see Southern Maine. 1907. Active; focal plane 48 ft (14.5 m); red flash every 4 s (white sector covers clear channel). 40 ft (12 m) round tower, lower part unpainted granite blocks and upper part brick painted white, connected to land by a wood walkway. Lantern painted black. Solar-powered 250 mm lens; the original 4th order Fresnel lens is on display at the Maine Lighthouse Museum in Rockland. Original 2-1/2 story stucco and wood keeper's quarters converted to a bed and breakfast inn originally owned by Jeff and Judi Burke. Original oil house (now used as a guest house) and other buildings. A photo is at right, Anderson's page has several photos, Trabas has Boucher's photo, Giles Blaney has a 2018 photo, Marinas.com has aerial photos, and Google has a satellite view. 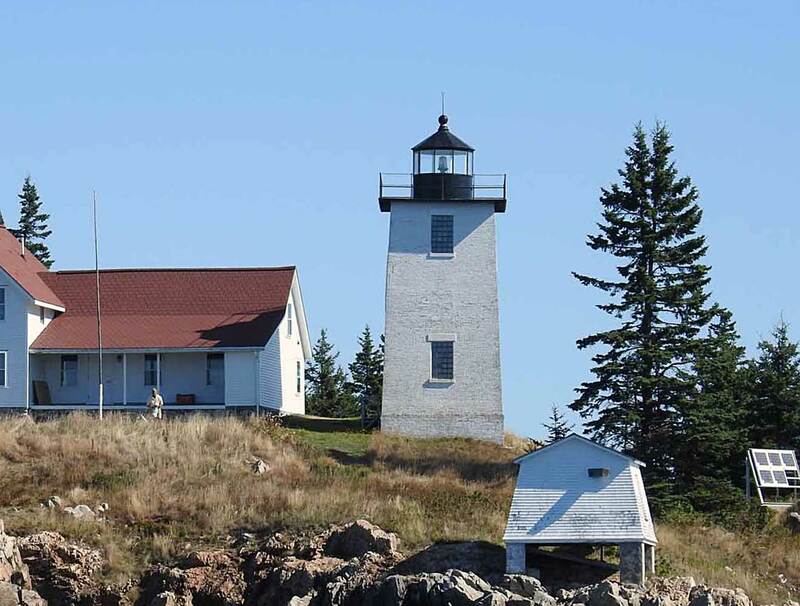 The tower was transferred to the town in 1998 under the Maine Lights program and restored by Campbell Construction Co. for the Isle Au Haut Lighthouse Committee in 1999. In January 2015 fundraising began for a new restoration of the tower; the project was estimated to cost $350,000. After raising $140,000, the Committee proceeded with the first phase of the project in spring 2018. Meanwhile, in 1986 Jeff and Judi Burke purchased the keeper's house for $190,000 and spent another $100,000 converting it into the Keeper's House Inn. After two decades of successful operation the Burkes closed the inn in 2007 and placed it for sale. It finally sold in January 2013 to Dr. Marshall Chapman, who reopened the inn in summer 2013. In August 2018 Chapman placed the inn for sale for $1.975 million, but it appears it is still in operation. Located on Robinson Point on the west side of Isle au Haut, facing Isle au Haut Bay. The island is accessible by passenger ferry from Stonington. Site open, tower closed. Operator: U.S. Coast Guard. Owner/site manager: Town of Isle au Haut (tower) and Keeper's House. ARLHS USA-404; Admiralty J0068; USCG 1-3360. 1839 (Alexander Parris). 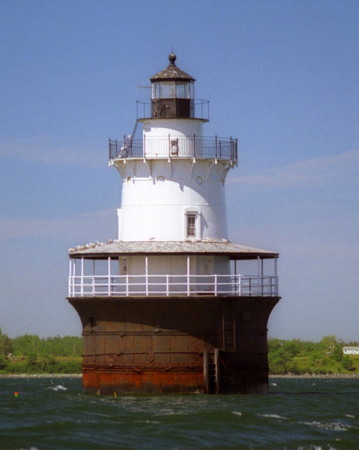 Active; focal plane 52 ft (16 m); white flash every 6 s. 42 ft (13 m) ft old-style round granite tower with lantern and gallery, incorporating very cramped keeper's quarters; 300 mm lens. Tower unpainted; lantern painted black. Fog horn (blast every 10 s). All other light station buildings demolished in the 1960s. Anderson has a good page for the lighthouse, Lighthouse Digest has D'Entremont's article on its history, Trabas has Boucher's closeup photo, Marinas.com has aerial photos, Huelse has a historic postcard view showing the additional keeper's quarters that were formerly attached, and Google has a satellite view. This historic tower is the oldest surviving waveswept lighthouse in the U.S. It was designed by Alexander Parris (1780-1852), one the country's best known architects at the time. In 2009 the lighthouse became available for transfer under NHLPA but it appears that it was later withdrawn. Located on a tiny, isolated island in the mouth of Isle au Haut Bay, between Isle au Haut and Vinalhaven. Accessible only by helicopter; it can be seen by boat, but it is almost impossible to land on the rocky island. Site and tower closed. Owner/site manager: U.S. Coast Guard. ARLHS USA-716; Admiralty J0064; USCG 1-3325. 1890. Active; focal plane 51 ft (15.5 m); red flash every 4s; a narrow white sector covers the channel. 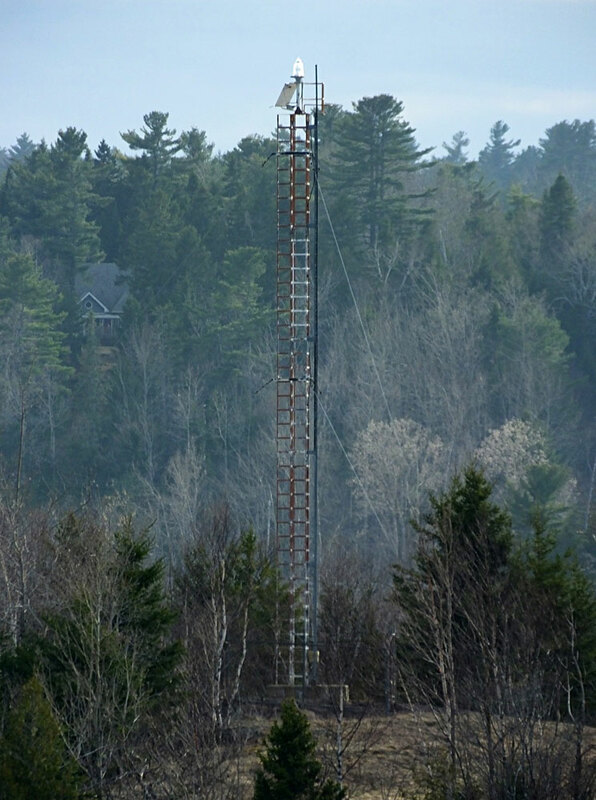 51 ft (15.5 m) sparkplug style round cast iron tower with lantern and three galleries, mounted on a concrete caisson, incorporating 2-story keeper's quarters; solar-powered 250 mm lens. Tower painted white; lantern roof is black. Fog horn (blast every 10 s). Eric Jensen's photo is at right, Anderson's page has good photos, Trabas has Boucher's photo, Hanna Collins has a closeup photo, Marinas.com has aerial photos, Huelse has a historic postcard view, and Google has a satellite view. 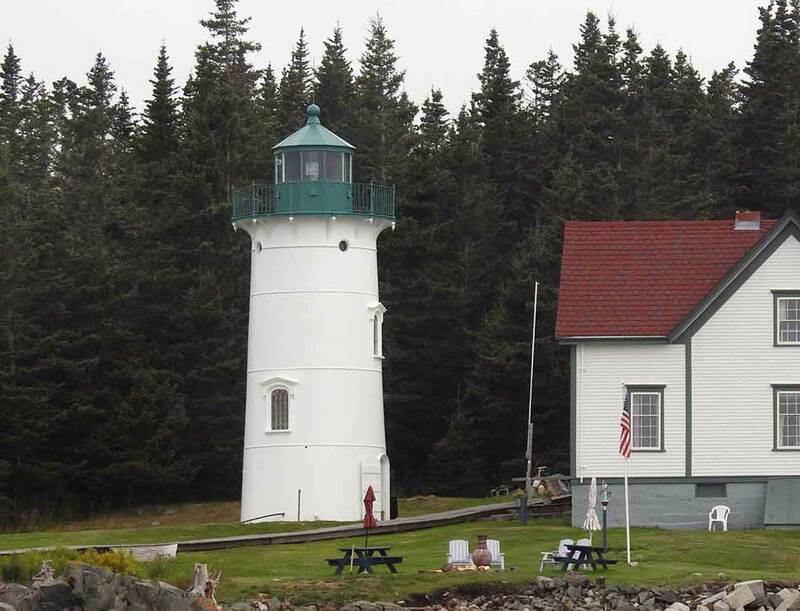 The lighthouse was offered under the Maine Lights program, but there were no takers. In 2004 it was again offered for transfer, this time under NHLPA. 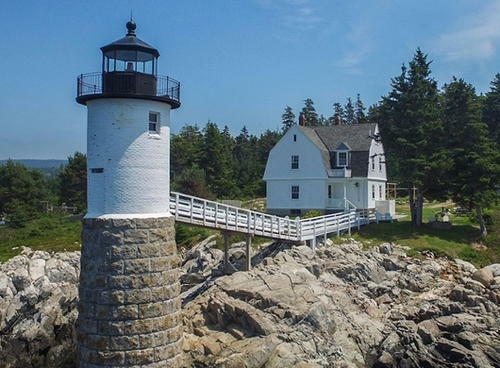 Again there were no takers, and the lighthouse was sold at auction for $27,000 to Beacon Preservation, a nonprofit organized by Casey Jordan of Ansonia, Connecticut. The preservation group has restored the interior of the lighthouse and opened it for overnight accommodations May through mid-October. Located on a rock in the east entrance to the Fox Islands Thorofare, east of North Haven. 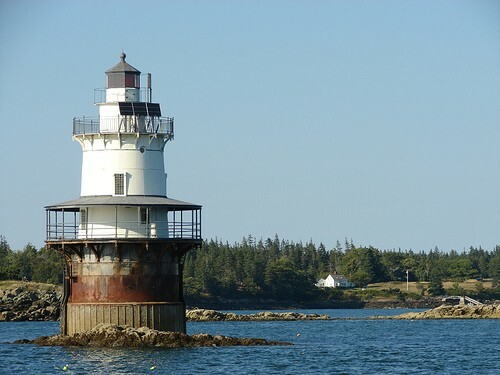 Accessible only by boat; visible distantly from Vinalhaven and North Haven. Site and tower closed. Operator: U.S. Coast Guard. Owner/site manager: Beacon Preservation. ARLHS USA-326; Admiralty J0074; USCG 1-3885. 1854. Active; focal plane 92 ft (28 m); continuous red light, day and night; white sector covers clear channel. 30 ft (9 m) round cylindrical brick tower with lantern and gallery, attached to a 2-story wood keeper's house (1895); 300 mm lens (1982). Tower painted white, lantern black with a red roof. Fog horn (blast every 30 s). Brick fog signal building (1944); an older fog siren is on display at Maine Lighthouse Museum in Rockland. Skylar Primm's photo is at right, Anderson's page has recent photos, Trabas has Boucher's closeup photo, and Google has a satellite view. After the keeper's house was heavily damaged by fire in 1989 the Coast Guard announced its intention to demolish the building. 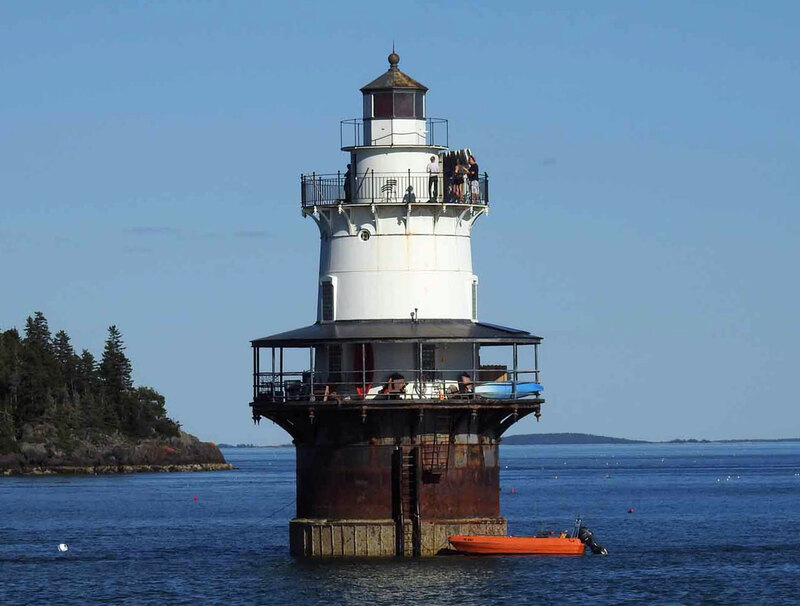 Following public protests, the Coast Guard agreed to transfer the lighthouse to the Island Institute, which leased it to a couple willing to restore it as a residence. In 2009, disregarding prior assurances of public access, the Island Institute sold the light station to the same couple. Located on a rocky headland at the southern end of Greens Island about 2 miles (3 km) southwest of Vinalhaven. Site and tower closed. Operator: U.S. Coast Guard. Owner/site manager: private. ARLHS USA-371; Admiralty J0112; USCG 1-3760. 1857 (station established 1832). Active; focal plane 39 ft (12 m); continuous white or red light, depensing on direction; the white sector covers the clear channel north of Fiddlers Ledge. 20 ft (6 m) round cylindrical brick tower with lantern and gallery, attached to a 1-1/2 story wood keeper's house (1857); 4th order Fresnel lens (1902). Buildings painted white, lantern and gallery black. Fog horn (blast every 10 s). Oil house (1903). Fog bell tower demolished; the original bell is on display at the Vinalhaven Historical Society museum. Anderson's page has good photos, Trabas has Boucher's photo, Huelse has a historic postcard view, and Google has a satellite view. 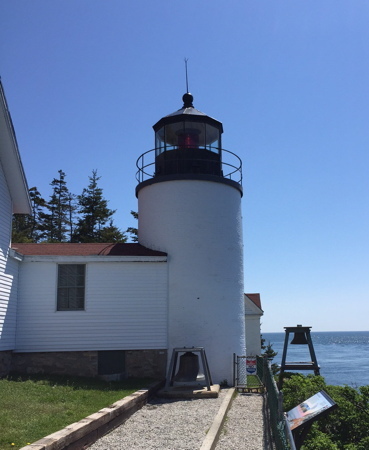 In 1998 the light station was transferred to the Town of Vinalhaven under the Maine Lights program; it became the residence of the Vinalhaven town manager, who also served as caretaker for the lighthouse. Ownership of the lighthouse was transferred to the American Lighthouse Foundation in October 2015. There were plans to offer overnight accommodations in the keeper's house but so far this hasn't happened. 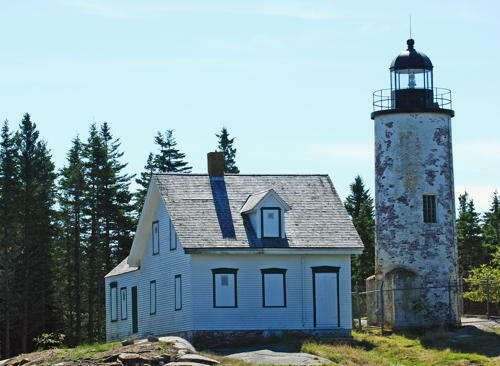 Located at the end of Browns Head Light Road on the northwest coast of Vinalhaven Island. The island is accessible by state ferry from Rockland. Site open, tower closed. Operator: U.S. Coast Guard. 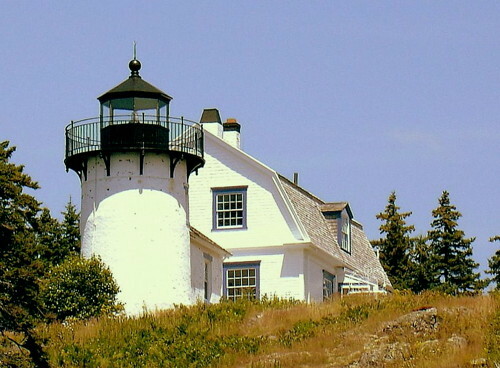 Owner/site manager: American Lighthouse Foundation (Brown's Head Lighthouse). ARLHS USA-088; Admiralty J0110; USCG 1-3965. 1857 (station established 1827). Active; focal plane 90 ft (27 m); white flash every 10 s. 48 ft (14.5 m) unpainted round cylindrical granite tower; the south tower is attached to a 2-story granite and wood keeper's quarters (1846). Solar-powered VRB-25 aerobeacon (1993) in south tower. Fog horn (blast every 15 s). 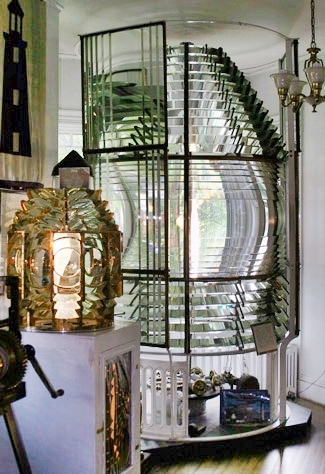 The original drum-style 3rd order Fresnel lens from the south tower is on display at the Maine Lighthouse Museum in Rockland. Stone oil house (1890). NOAA C-MAN automated weather station. The bases of the 1848 granite towers are also visible. Anderson has a good page for the lighthouse, Marinas.com has aerial photos, and Google has a satellite view. Matinicus is famous as the light station tended by Abigail Burgess Grant, daughter of one keeper and wife of another; at age 17 she tended the light heroically during an 1856 storm. The station was transferred to the Fish and Wildlife Service in 1998 under the Maine Lights program; the service and the Audubon Society use the keeper's house as a base for bird research during the summer. A very isolated and exposed light station, located on a bare rocky island 6 miles (10 km) south of Matinicus. Accessible only by boat or helicopter. Site and tower closed (bird nesting sanctuary). Operator: U.S. Coast Guard. Owner/site manager: U.S. Fish and Wildlife Service (Maine Coastal Islands National Wildlife Refuge). ARLHS USA-484; Admiralty J0116; USCG 1-0010. 1857 (station established 1827). Inactive since 1924. Approx. 35 ft (11 m) unpainted round cylindrical granite tower; lantern removed. Google has a satellite view. Located about 80 m (265 ft) northeast of the south tower. Site and tower closed (bird nesting sanctuary). Owner/site manager: U.S. Fish and Wildlife Service (Maine Coastal Islands National Wildlife Refuge). ARLHS USA-484. 1857 (station established 1836). Active; focal plane 88 ft (26 m); continuous white light, day and night. 31 ft (9.5 m) square cylindrical brick tower with lantern and gallery, attached to 1-1/2 story wood keeper's house. The original 4th order Fresnel lens is still in use. Buildings painted white; lantern is black and house has a red roof. Fog horn (blast every 10 s). Barn (1890) and brick oil house (1897). An unusually well preserved light station. The square pyramidal wood bell tower (1890), one of the few still in use in New England, now houses the fog horn; the original bell is on display. Jonathan Rissmeyer's photo is at right, Anderson's fine page also has good photos, Trabas has a good closeup by Boucher, Marinas.com has aerial photos, and Google has a street view and a satellite view. The keeper's house is occupied; since 1988 former keeper Terry Cole and his wife Jeri have been the resident caretakers of the station. Ownership was transferred to Maine State Parks under the Maine Lights program in 1997. Located on the west side of the mouth of the Penobscot River in Stockton Springs. Site open, tower closed. Operator: U.S. Coast Guard. Owner/site manager: Maine State Parks (Fort Point State Park). ARLHS USA-296; Admiralty J0086; USCG 1-3585. Date unknown. Active; focal plane 23 ft (7 m); red flash every 4 s. 6 m (20 ft) square solid stone pyramid with a light on a short post at the apex. Trabas has Boucher's photo, and Google has a satellite view. This one of more than a dozen 19th century stone daybeacons on the coast of Maine, but we do not know when the light was added. Located on Fort Point Ledge, a dangerous reef about 1 km (0.6 mi) south of the Fort Point lighthouse. Accessible only by boat, although there should be a good view from the lighthouse. Owner/operator: U.S. Coast Guard. Site open, tower closed. Admiralty J0086.2; USCG 1-3580. 1912 (daybeacon established 1826). Inactive for many years. 15 ft (4.5 m) stone pyramid topped by the stump of a former round lantern. A blogger has photos, a historic postcard view shows the appearance of the light when it was active, and Google has a satellite view. 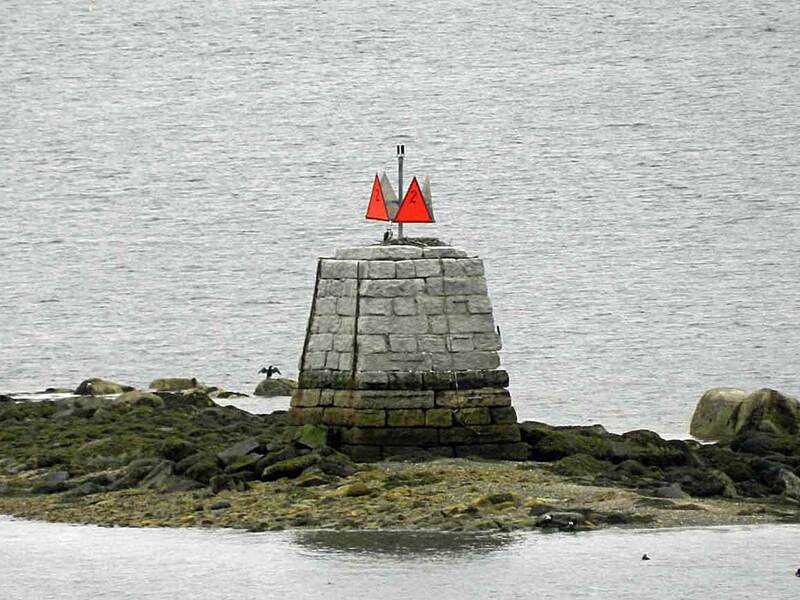 The stone pier is the fourth beacon at this location. The light was moved to a bell buoy. Located on a shoal in the entrance to the harbor of Belfast. Accessible only by boat. ARLHS USA-1254; USCG 1-4445. 1874 (station established 1851). Reactivated (inactive 1934-1987); focal plane 39 ft (12 m); green flash every 4 s. 39 ft (12 m) square brick tower with lantern and gallery, attached by a covered passageway to the original 1-1/2 story wood keeper's house; solar-powered 250 mm lens (1987). Tower painted white, lantern and gallery black. Brick oil house (1906). Trabas has Boucher's closeup photo, Robert English has a good 2007 photo, Anderson has a good page with several photos, Marinas.com has aerial photos, Huelse has a historic postcard view, and Google has a satellite view. The town of Isleboro bought the station for $1200 when it was deactivated in 1934 and put the keeper's house in use as the Sailor's Memorial Museum in 1938. A fog bell similar to the original is on display. In 1987, after many requests, the Coast Guard returned the light to the tower. Located on the southeast side of Islesboro Island at the entrance to Gilkey Harbor. 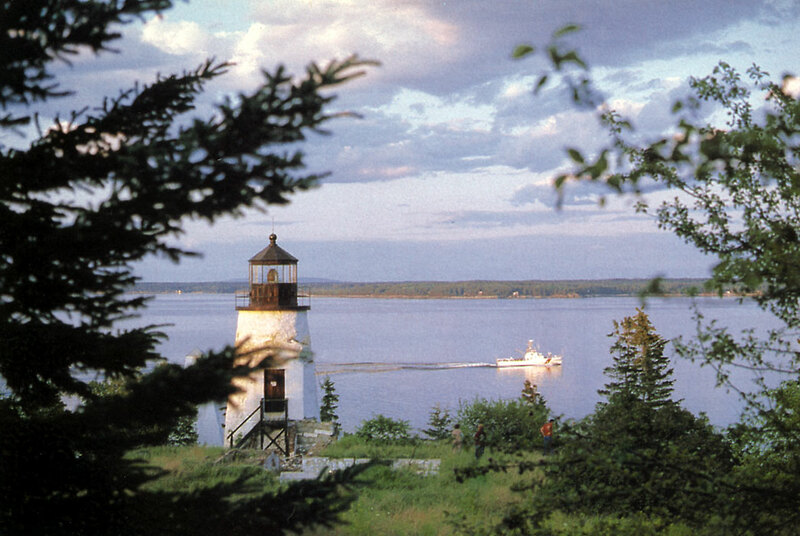 The island is accessible by state ferry from Lincolnville, and the light station is adjacent to the ferry terminal. Site open, museum and tower open daily except Mondays July 1 through Labor Day (early September), tower closed. Operator: U.S. Coast Guard. 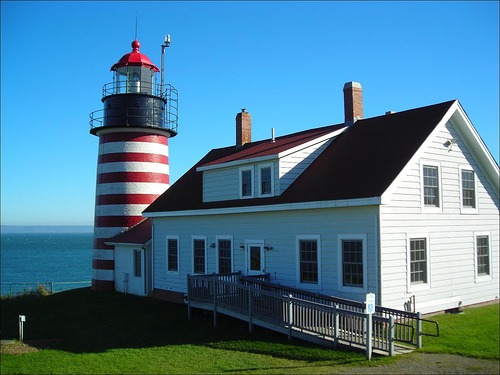 Owner/site manager: Town of Islesboro (Grindle Point Sailor's Museum and Lighthouse). ARLHS USA-356; Admiralty J0090; USCG 1-4405. Burnt Coat Harbor Range Front (1872-1883), Swans Island. This tower was demolished after being deactivated. ARLHS USA-1093. Crabtree Ledge (1890-1933), Frenchman's Bay. This sparkplug lighthouse collapsed into the water in 1950. 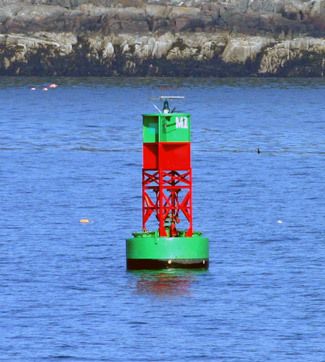 It was replaced by a bell buoy. ARLHS USA-197; USCG 1-2000. Posted May 16, 2001. Checked and revised March 26, 2019. Lighthouses: 37. Site copyright 2019 Russ Rowlett and the University of North Carolina at Chapel Hill.